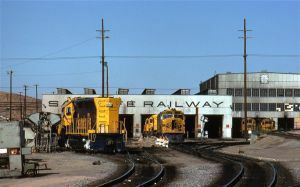 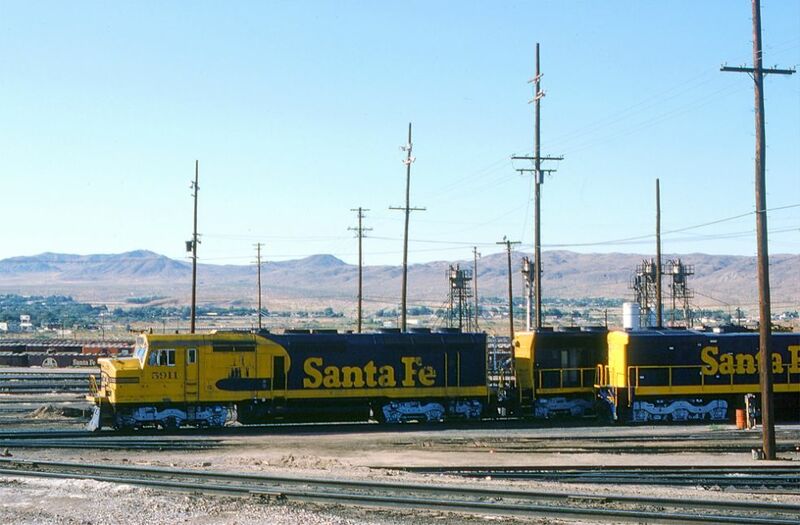 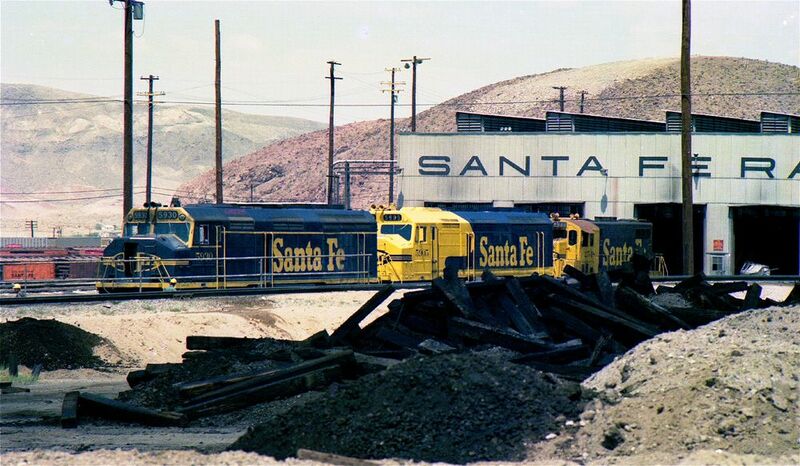 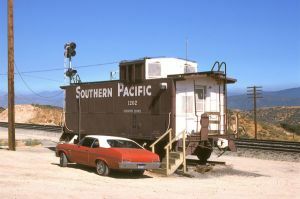 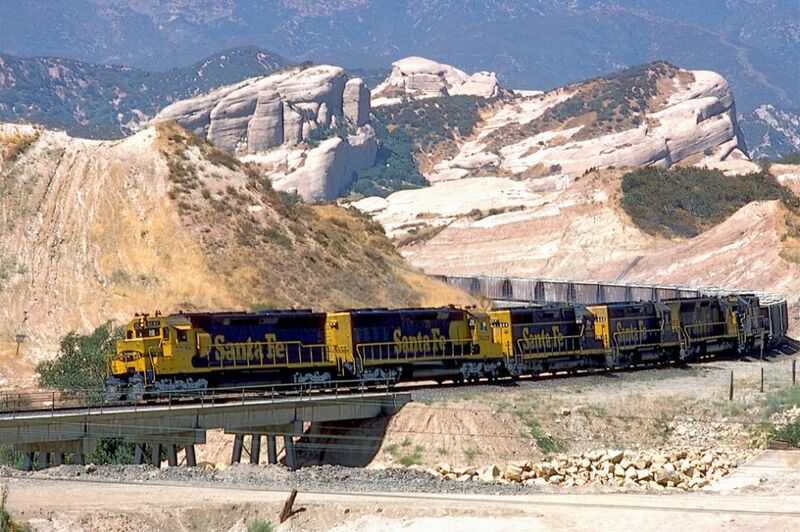 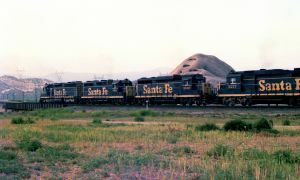 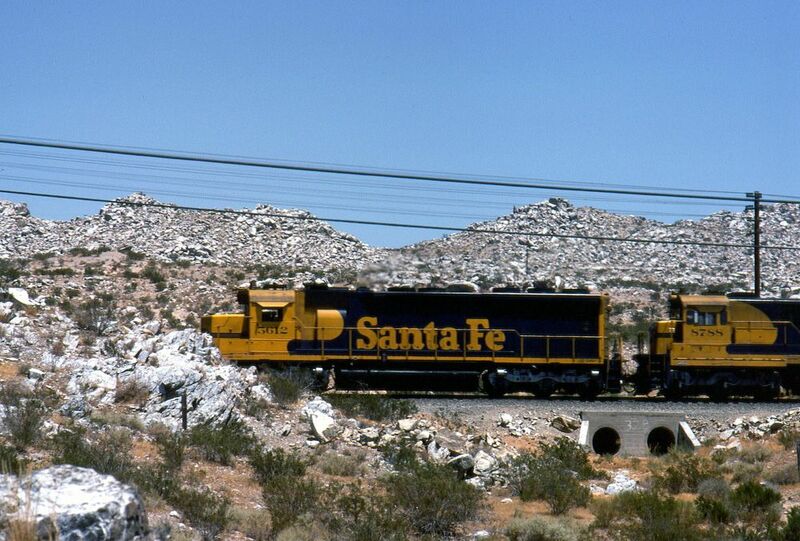 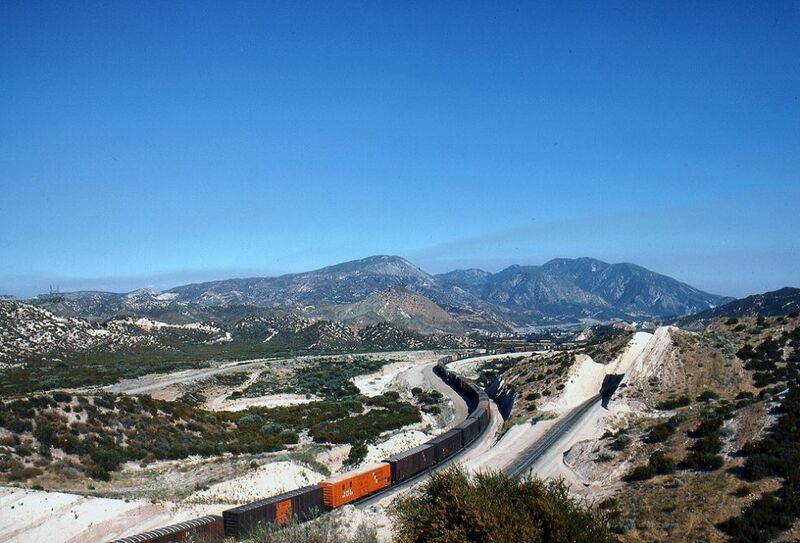 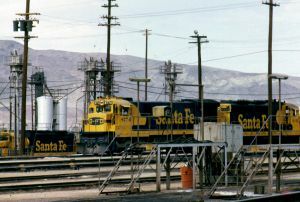 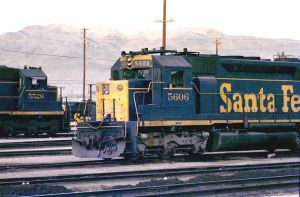 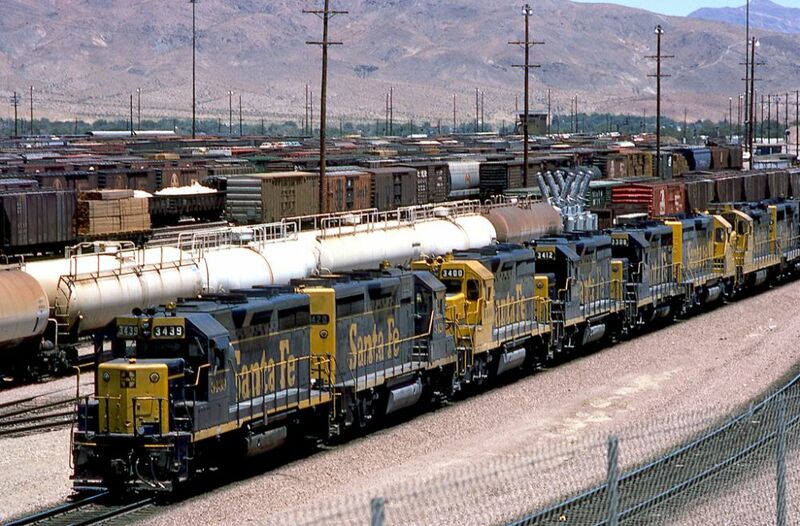 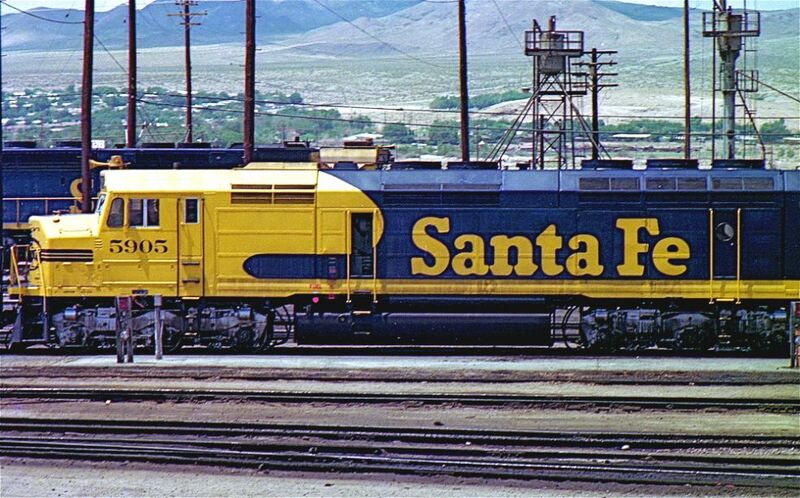 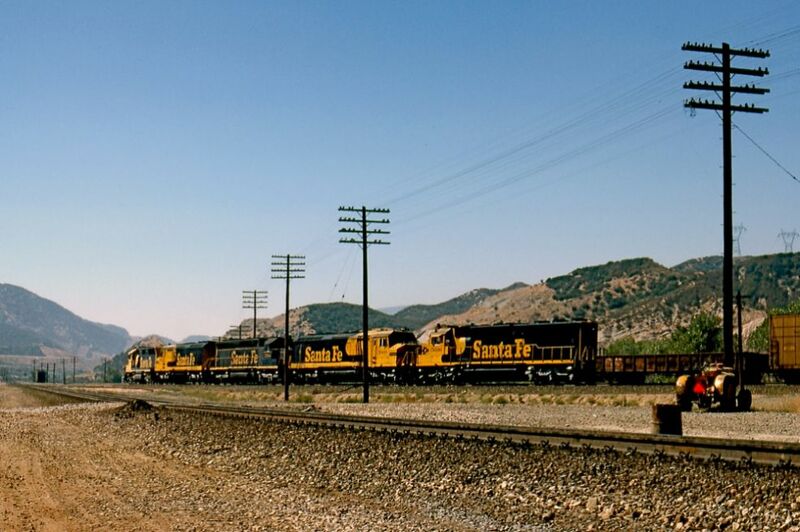 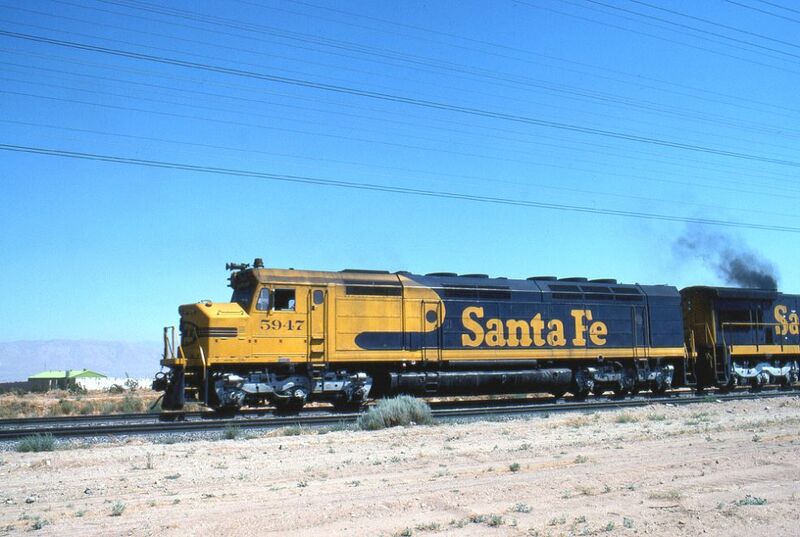 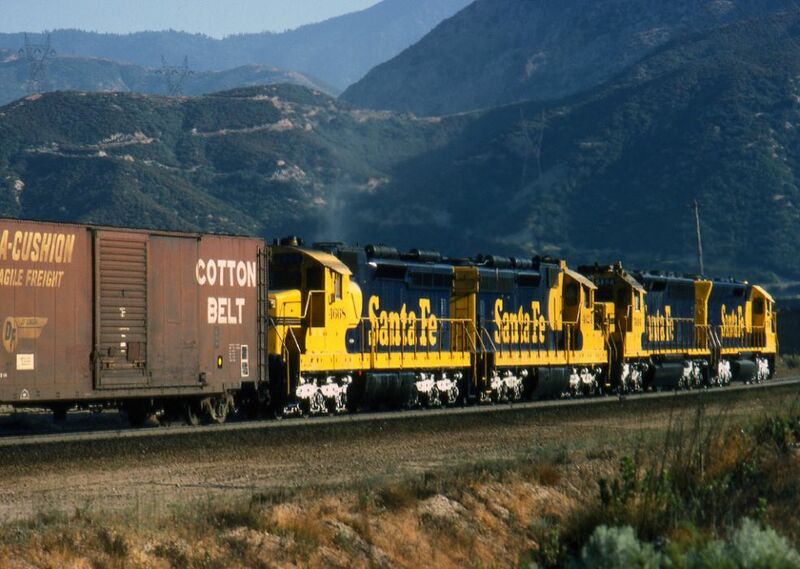 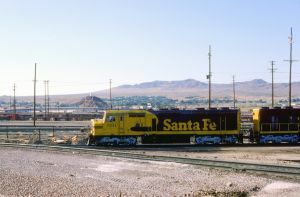 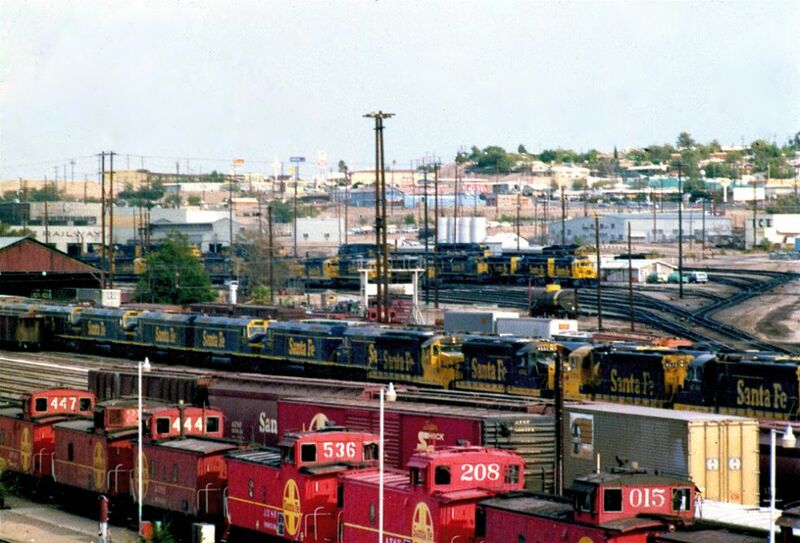 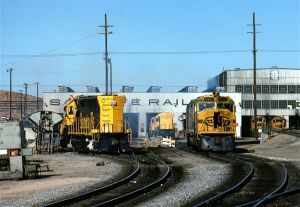 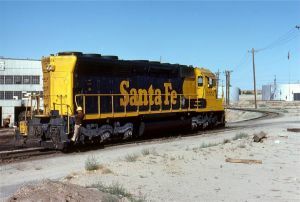 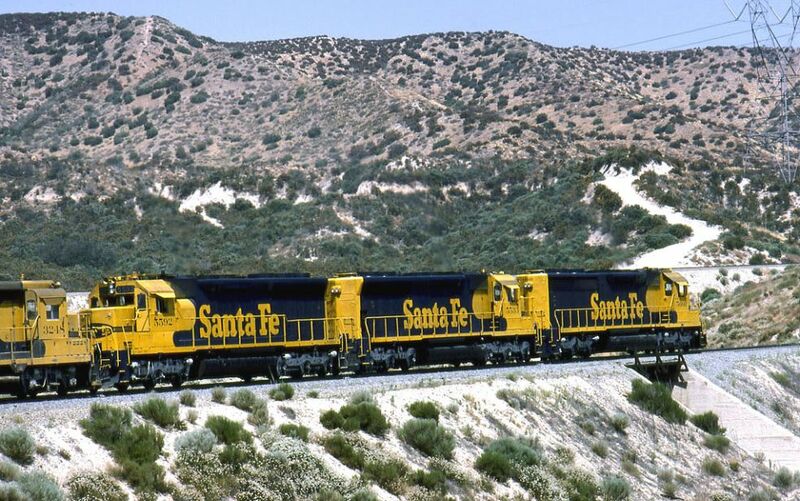 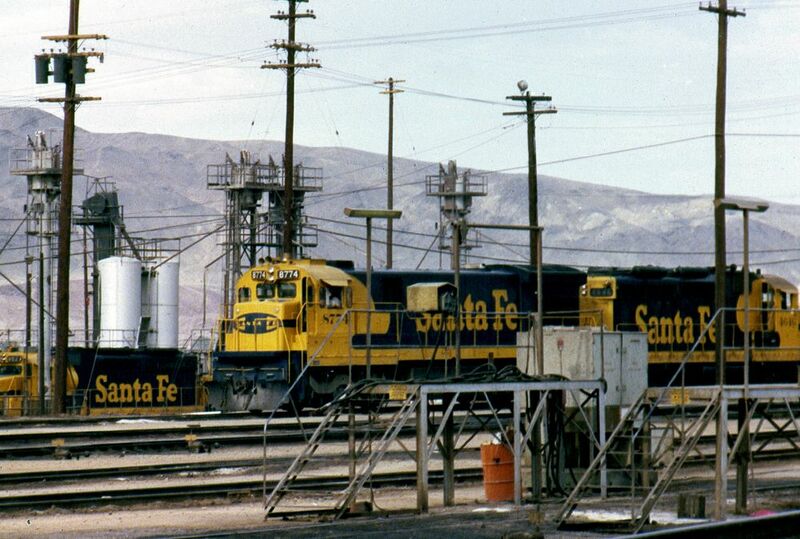 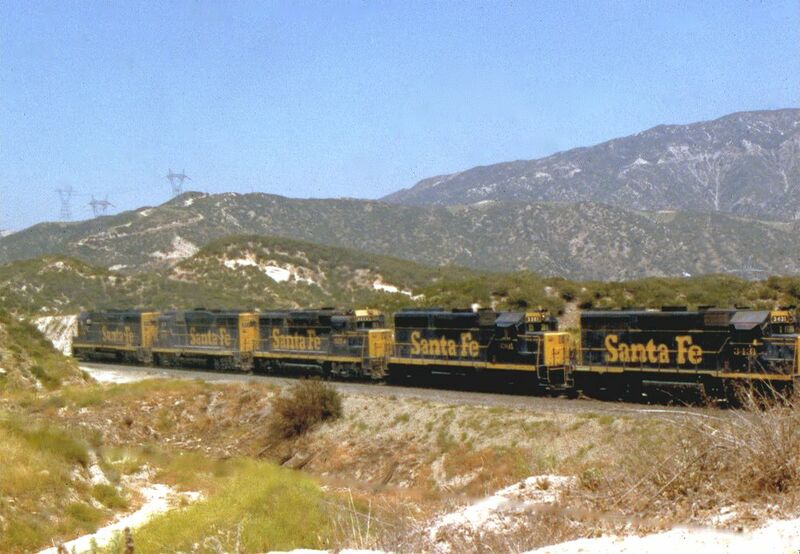 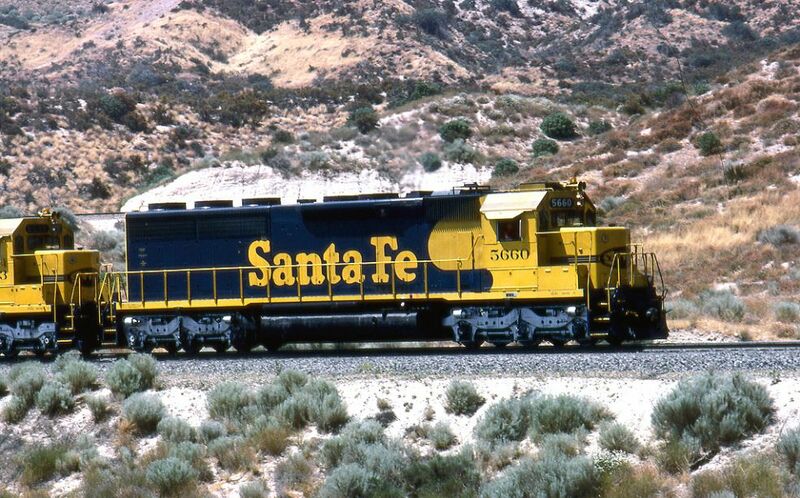 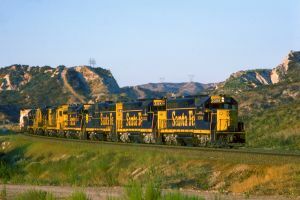 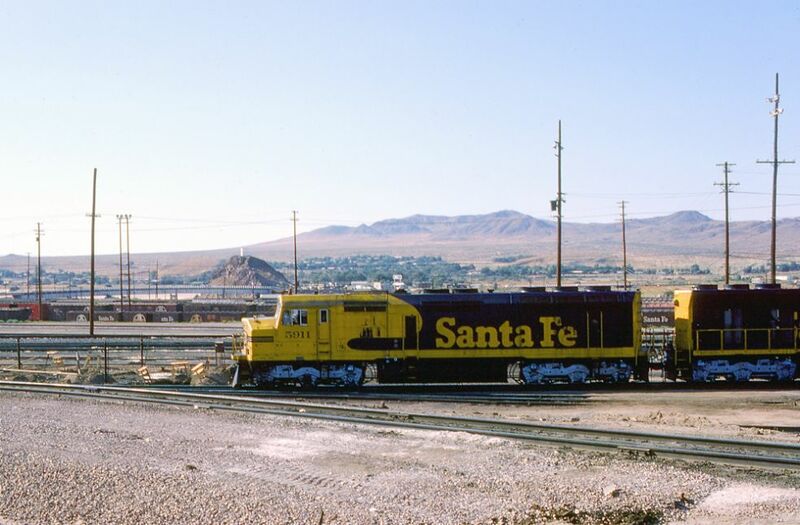 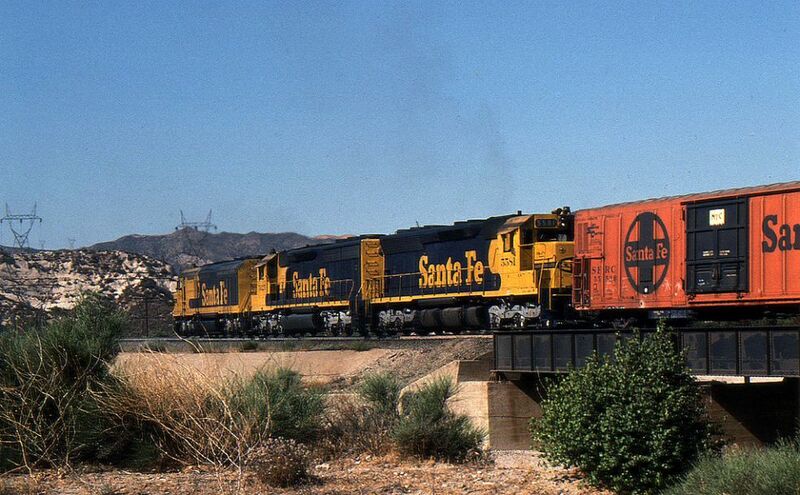 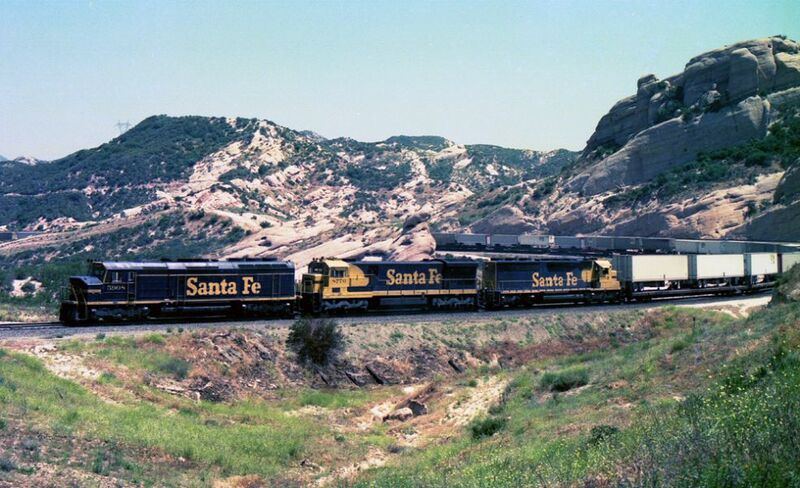 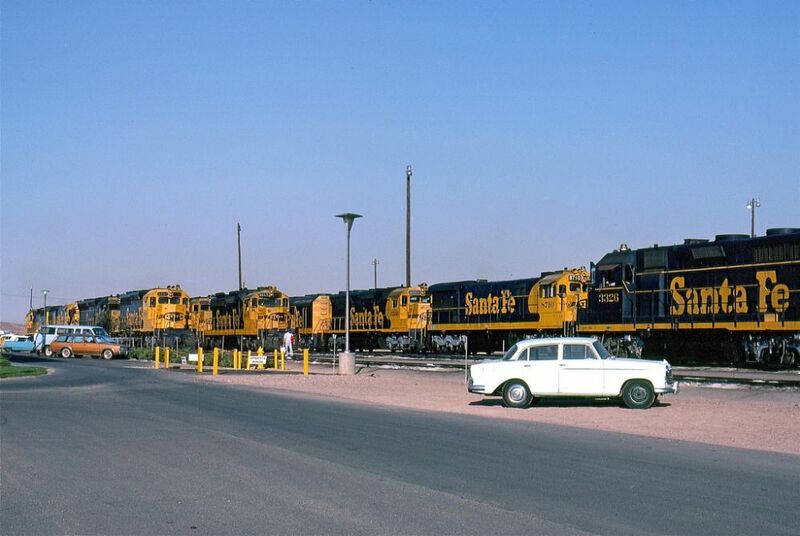 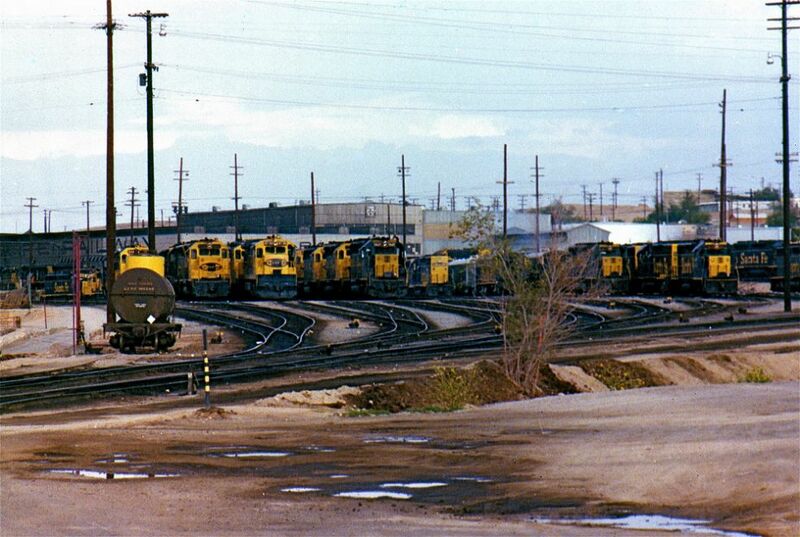 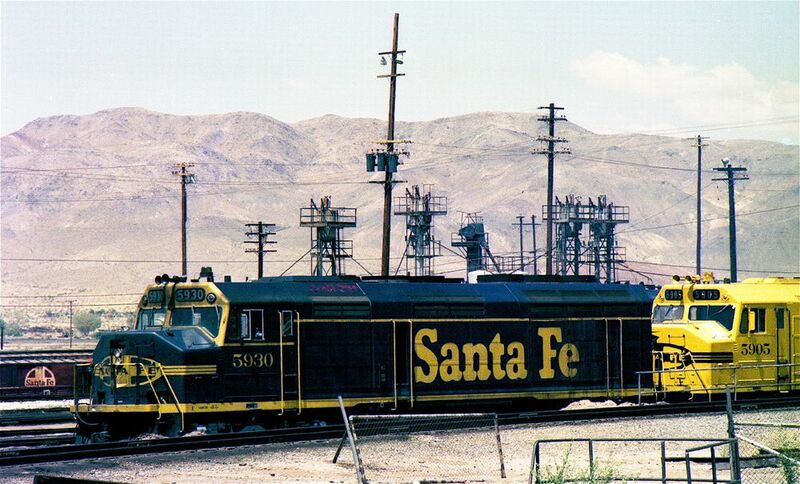 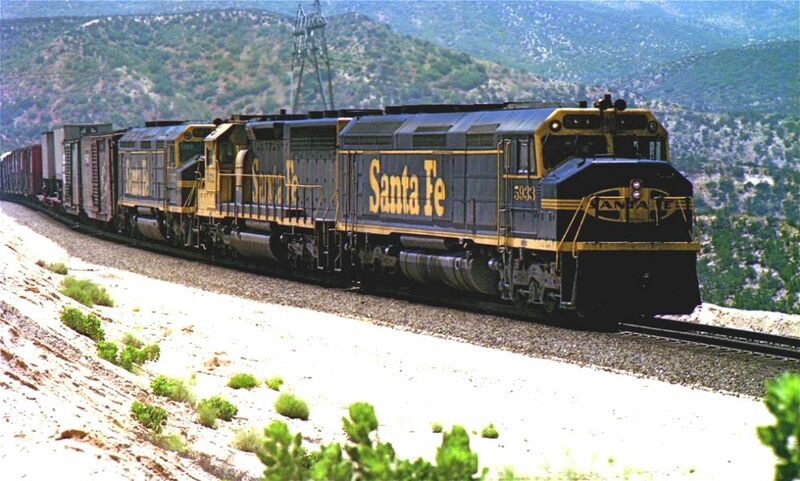 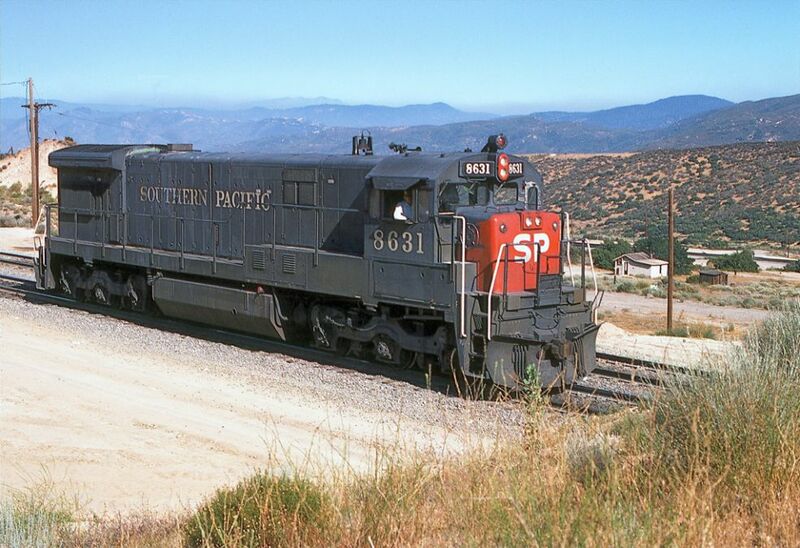 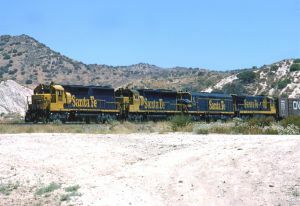 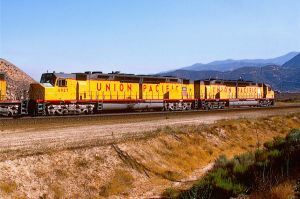 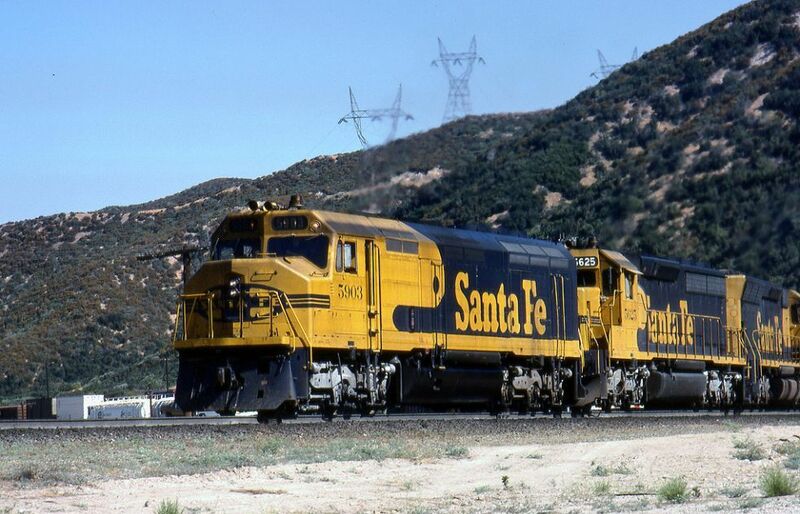 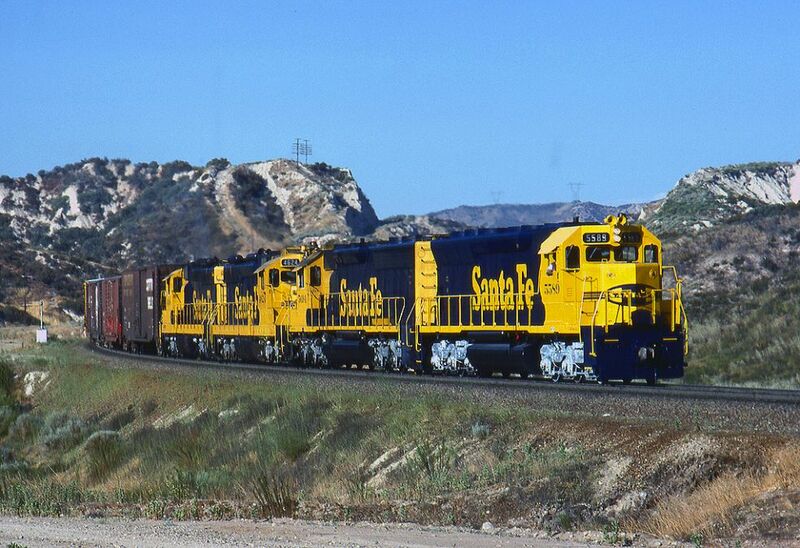 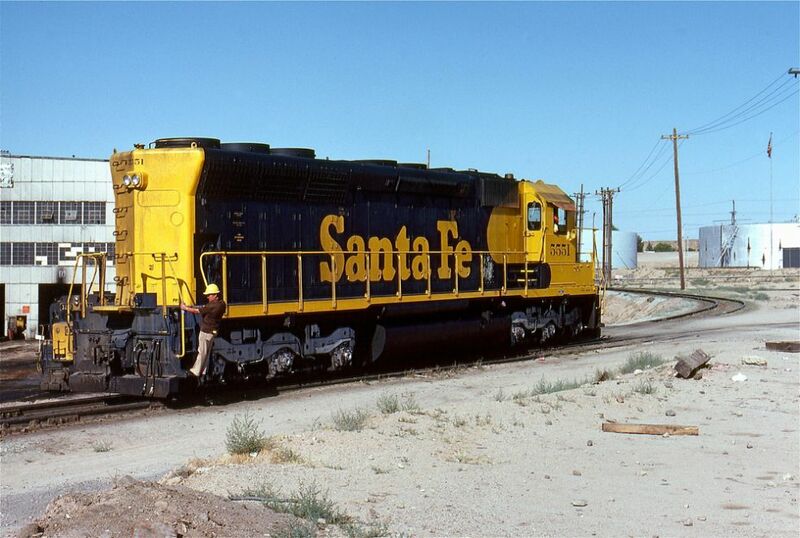 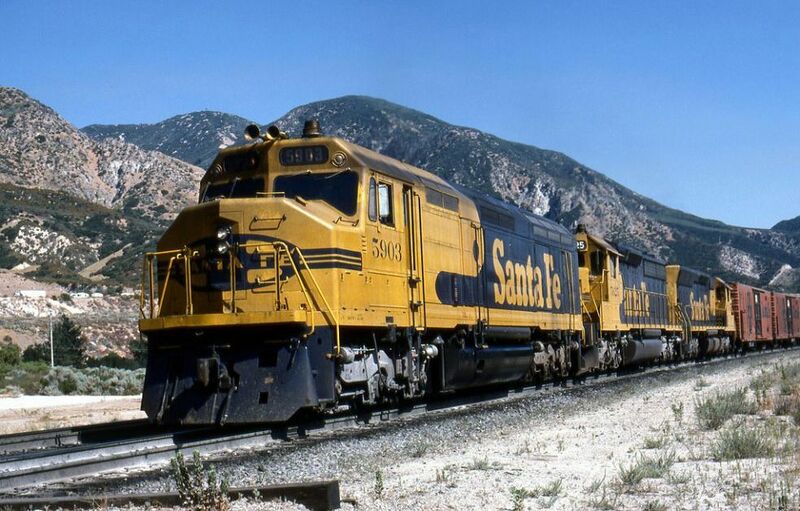 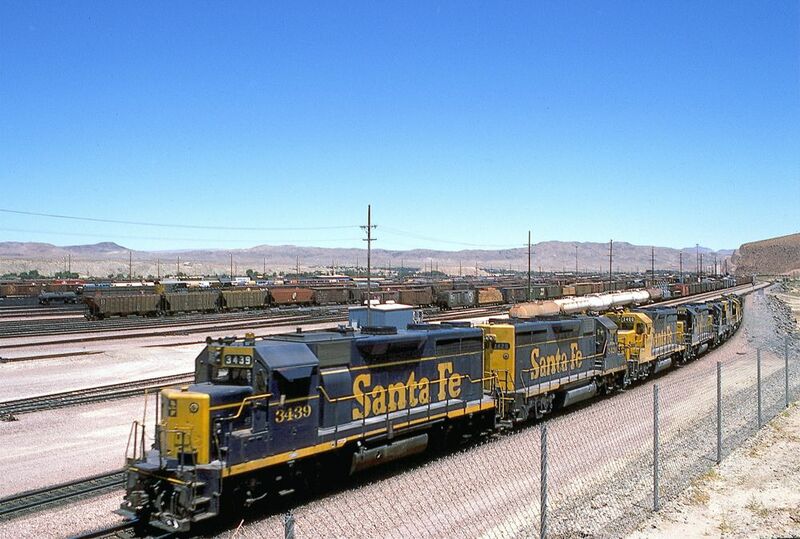 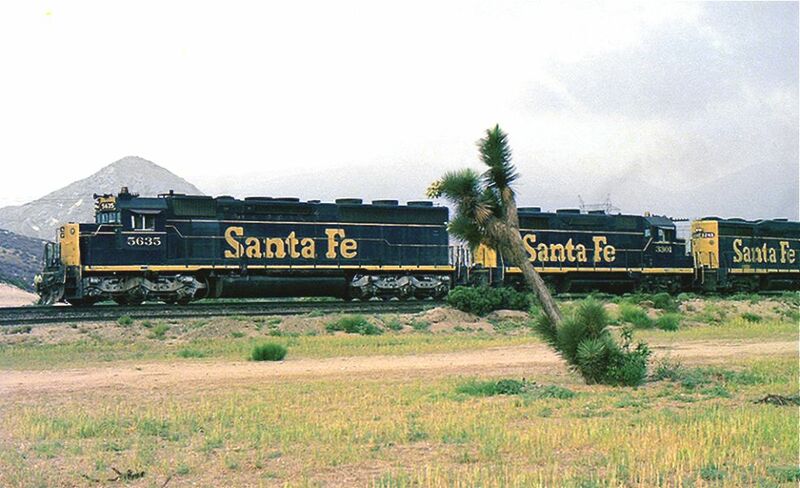 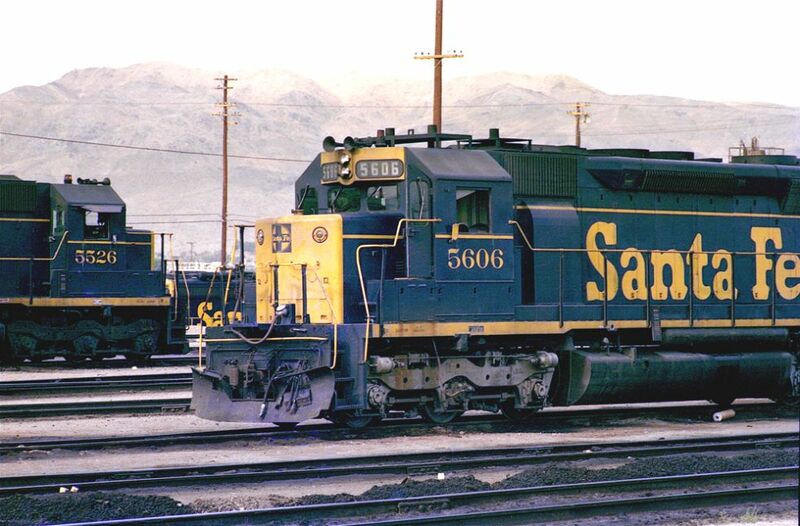 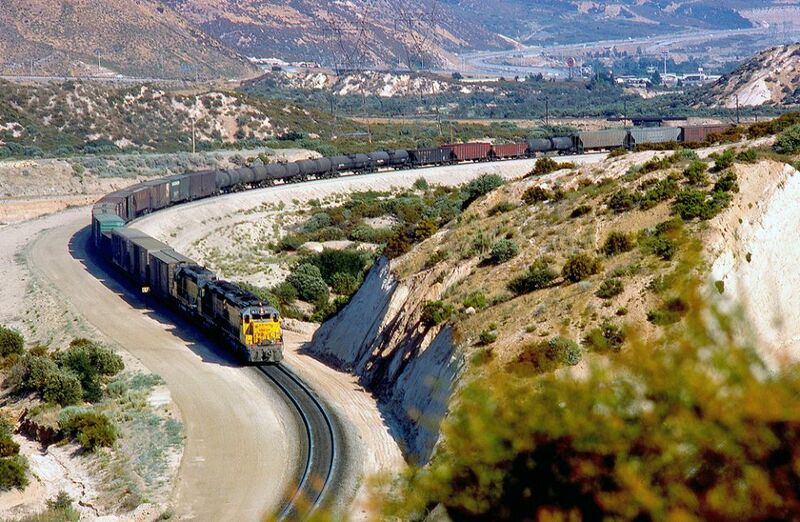 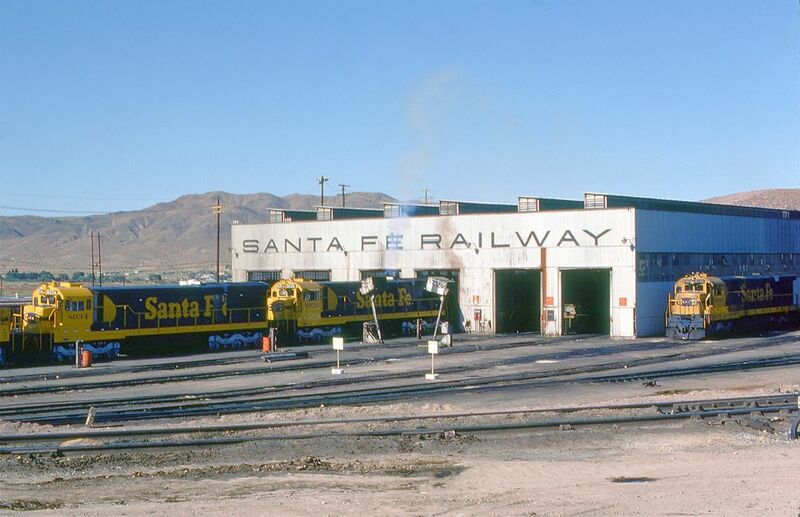 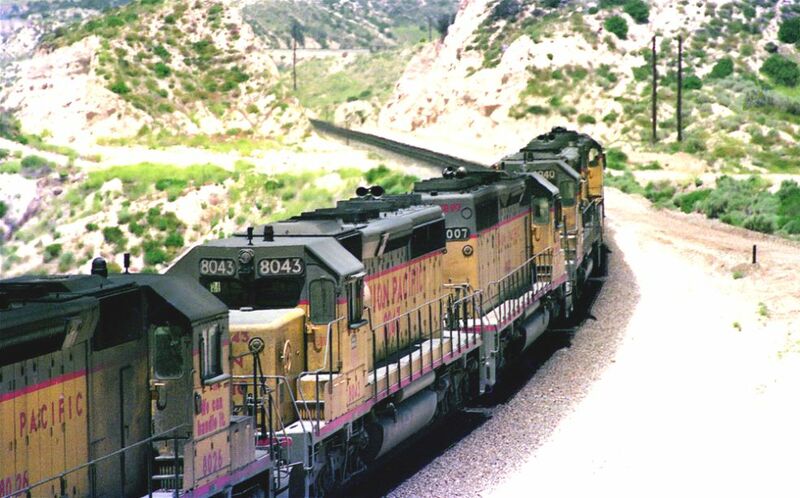 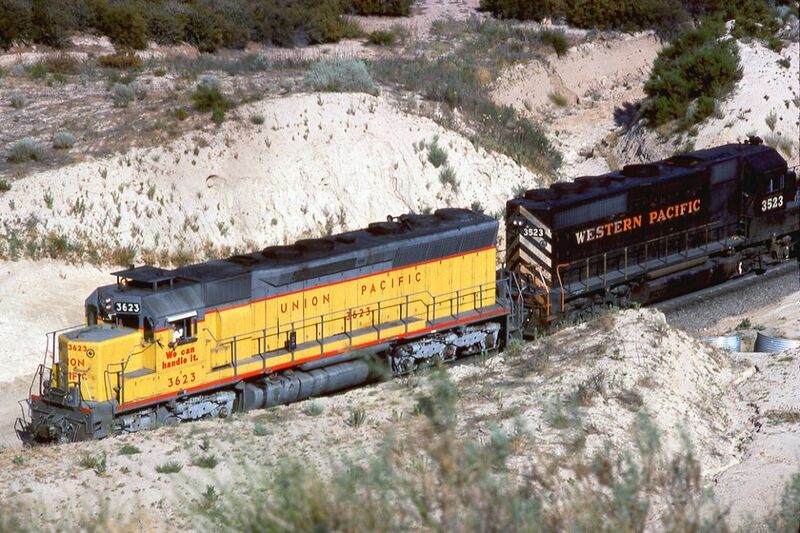 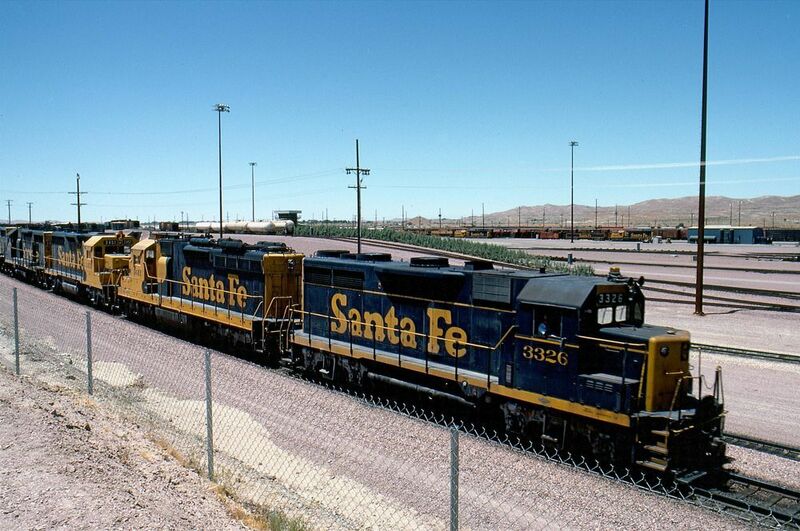 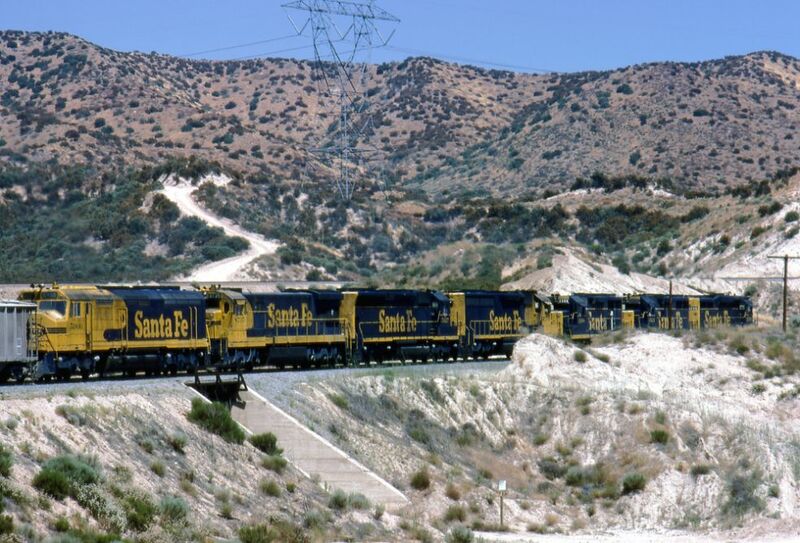 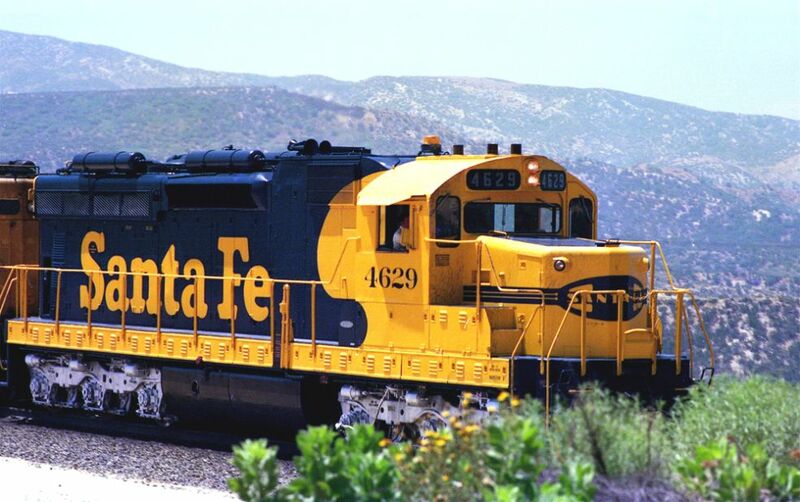 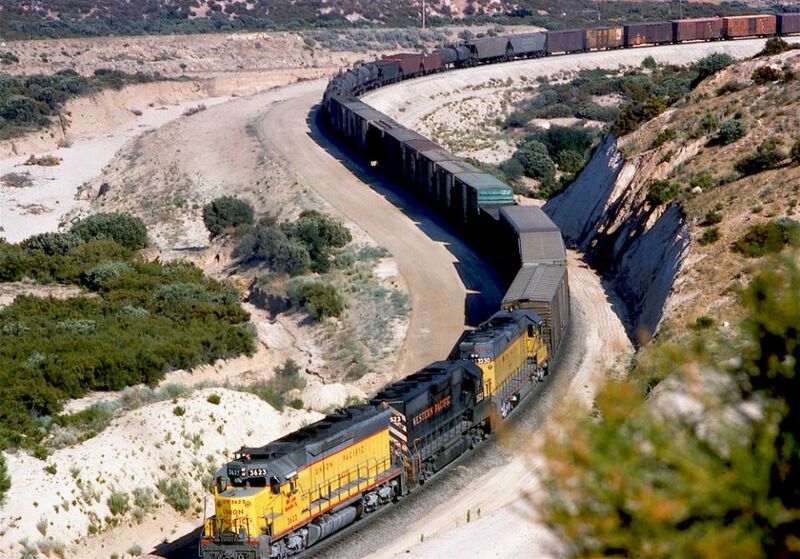 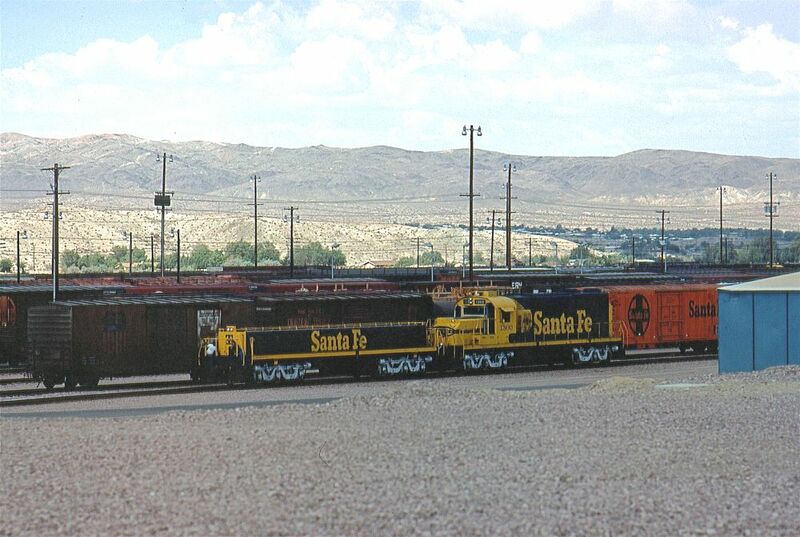 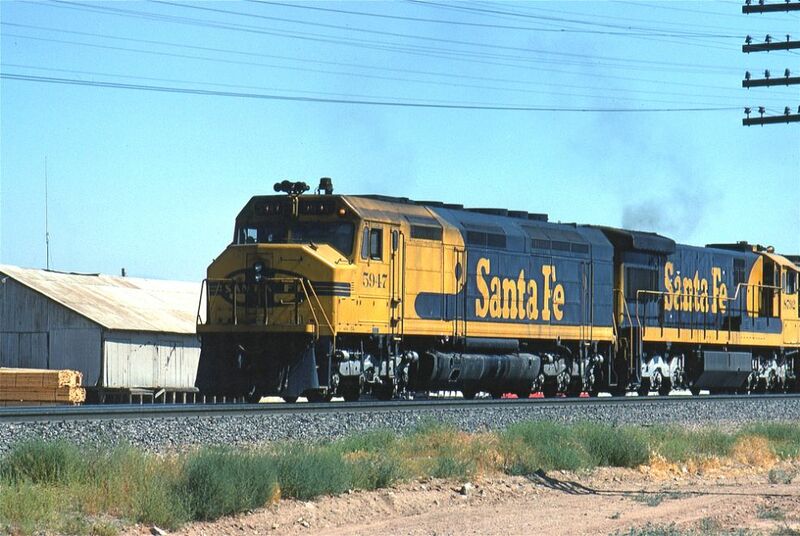 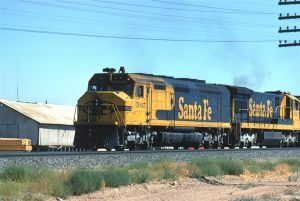 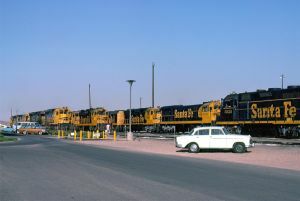 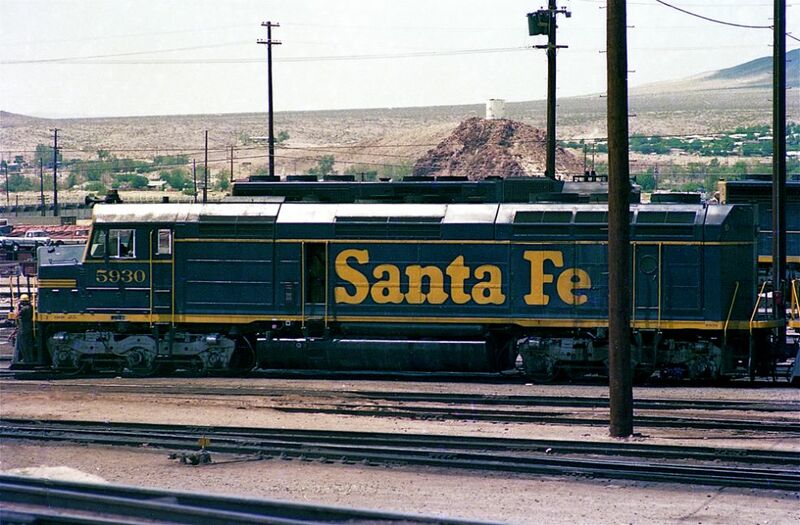 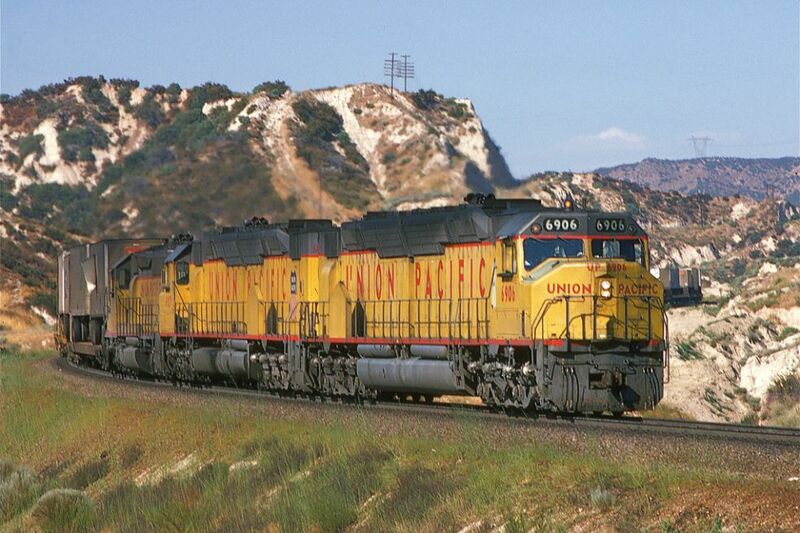 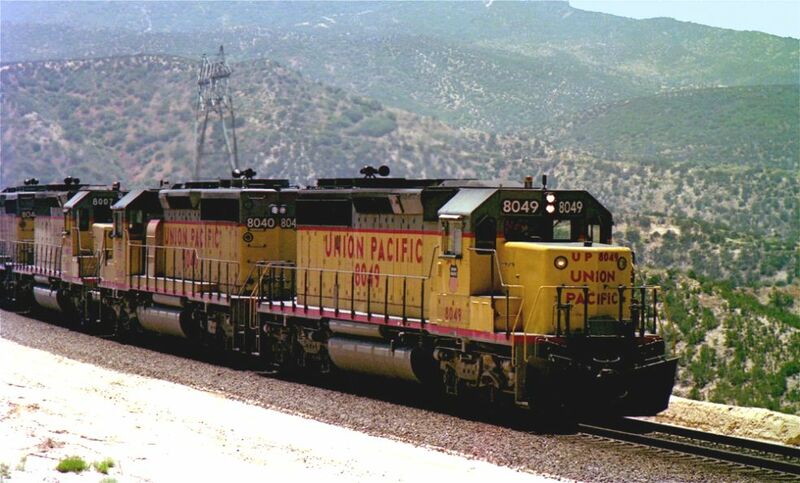 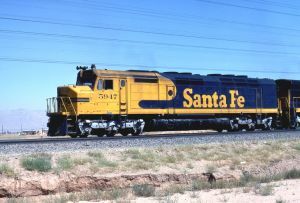 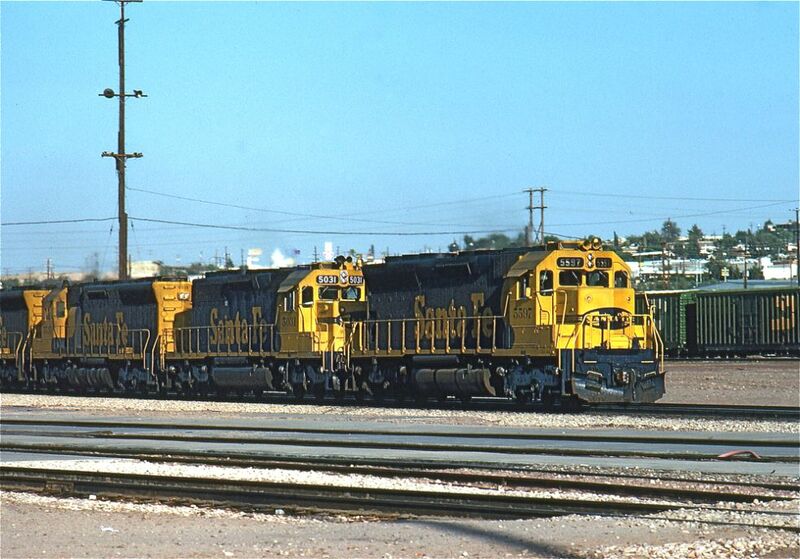 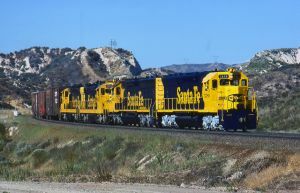 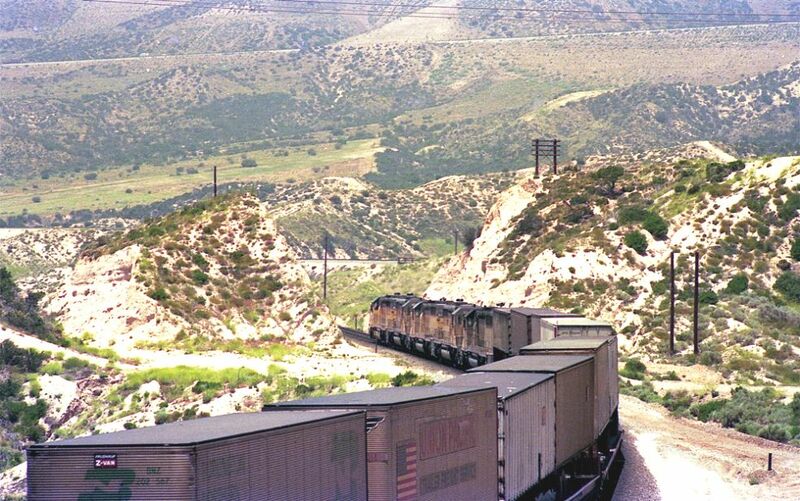 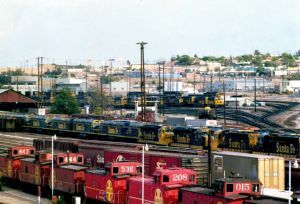 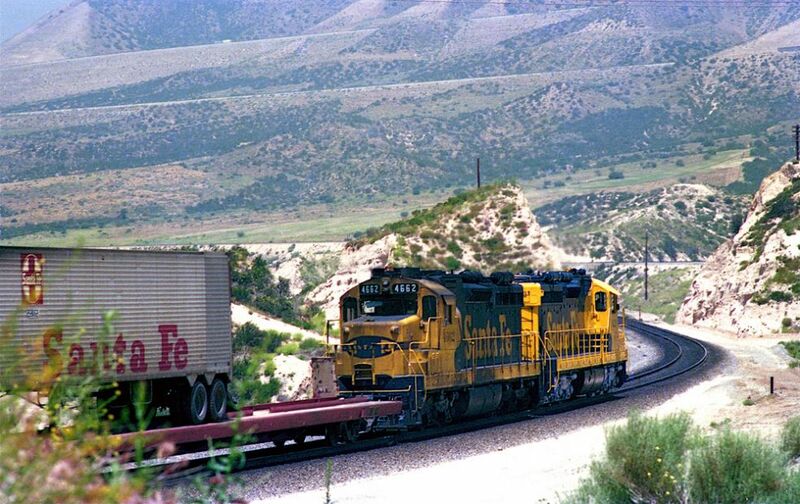 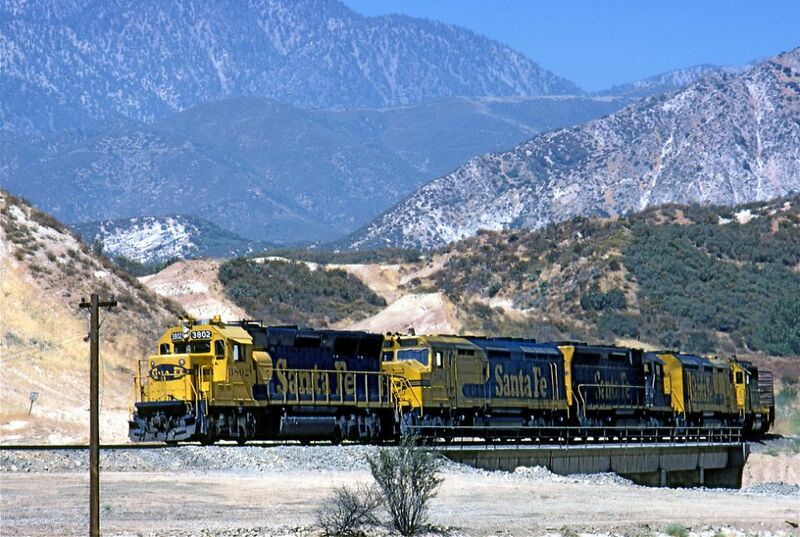 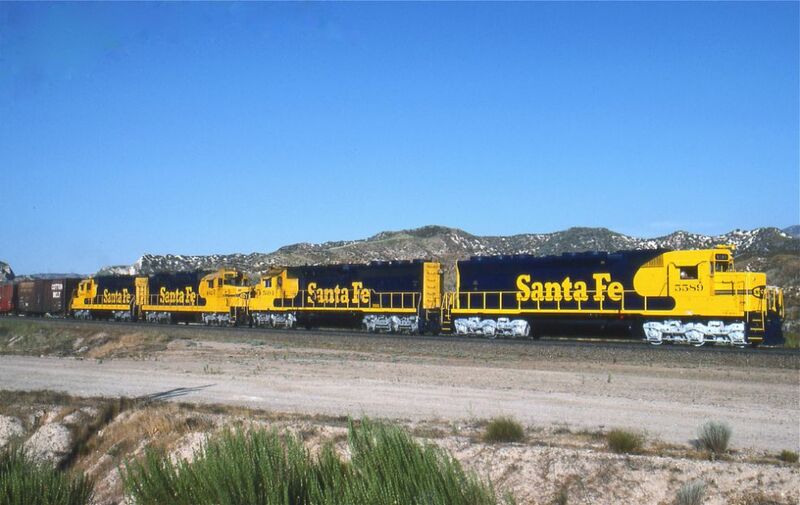 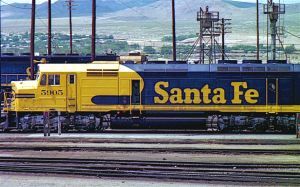 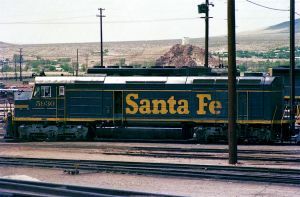 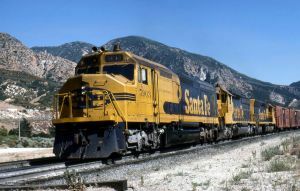 The good old days with Santa Fe, Southern Pacific and Union Pacific before the big mergers! 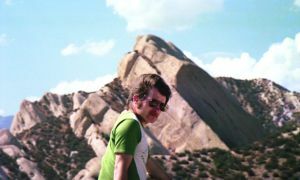 John and I (Werner) made the first foot steps to the USA in the 70's. 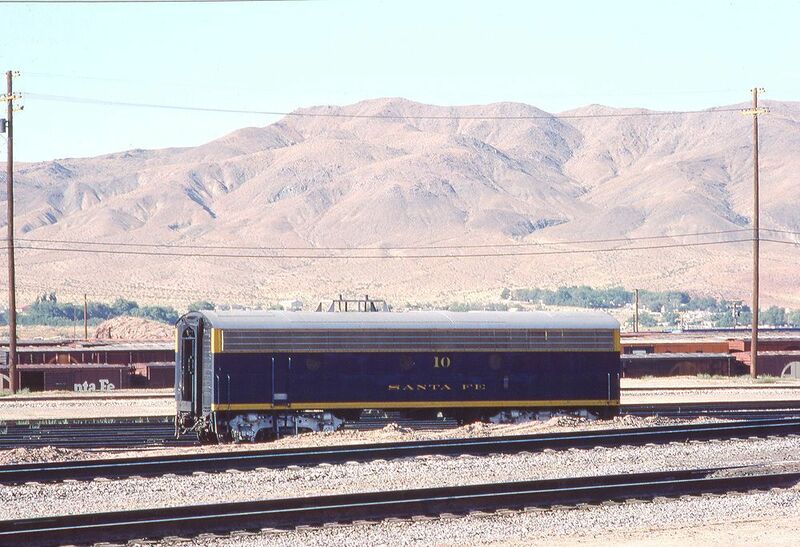 Our very first trip was in 1972 while visitting my relatives (the Meer's) in Midland Park, NJ. 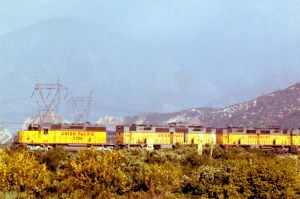 Our second trip was in 1974 to the West Coast. 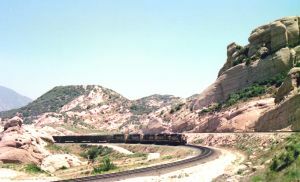 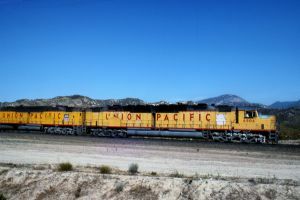 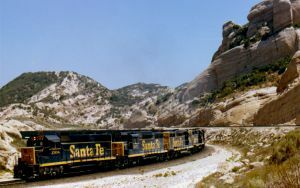 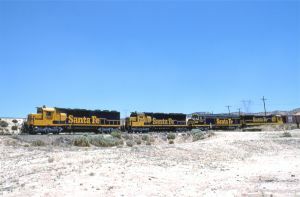 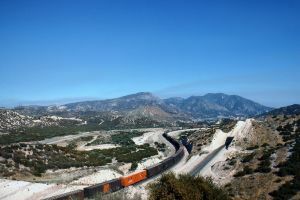 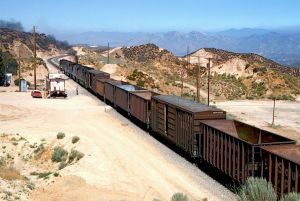 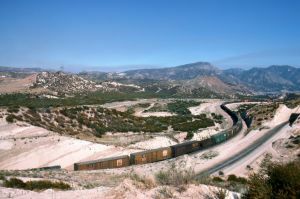 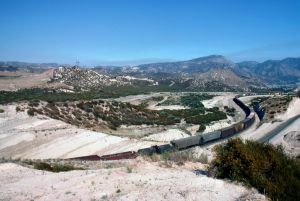 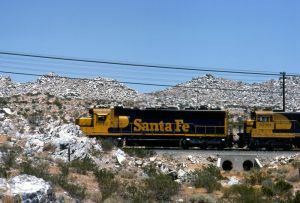 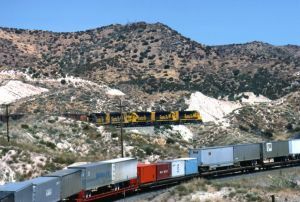 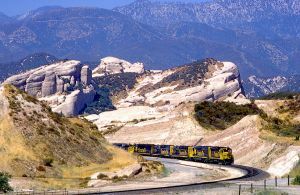 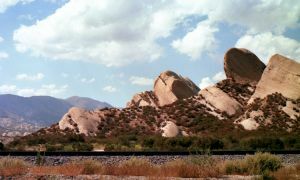 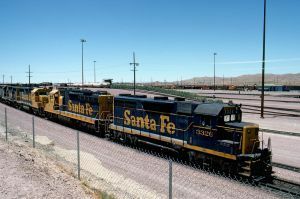 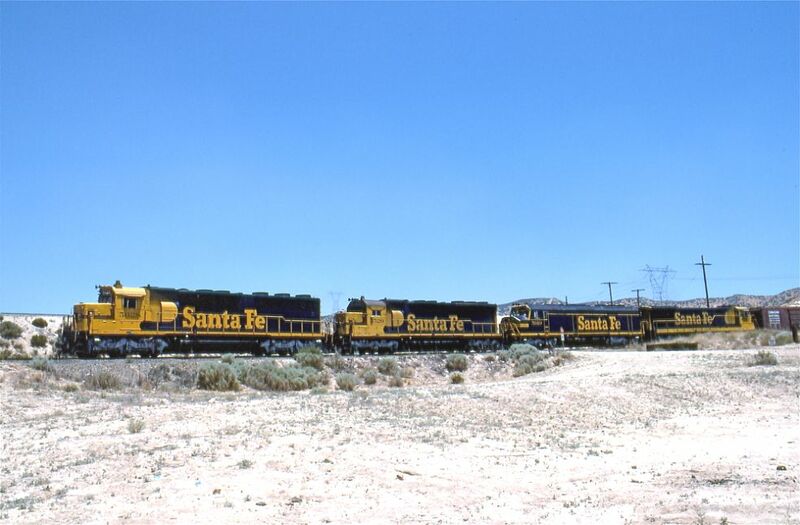 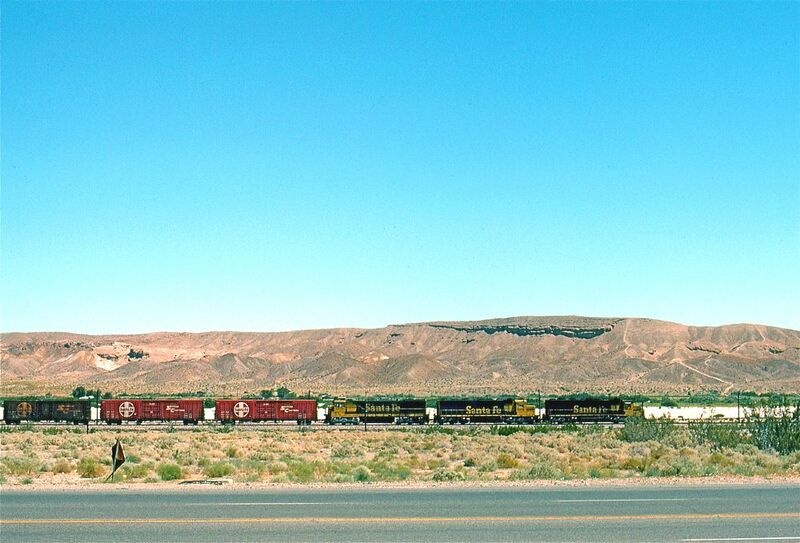 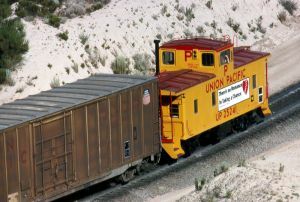 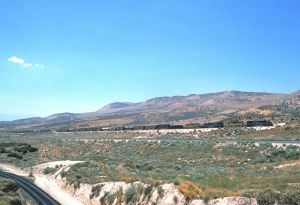 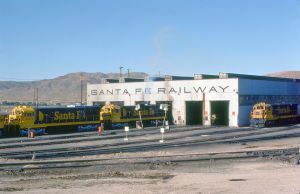 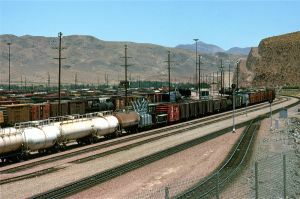 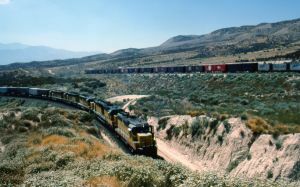 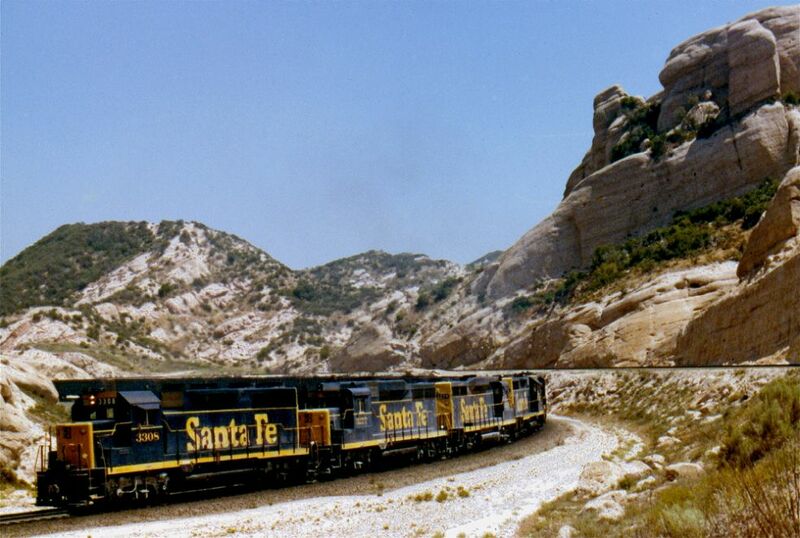 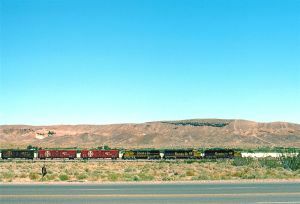 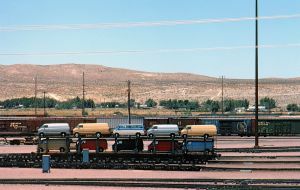 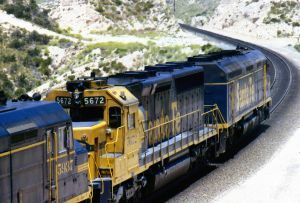 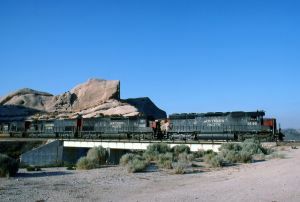 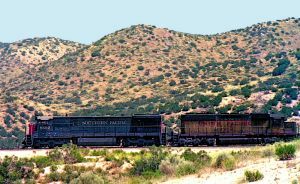 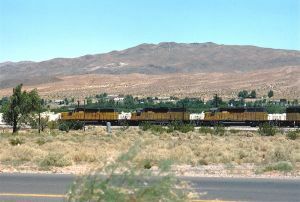 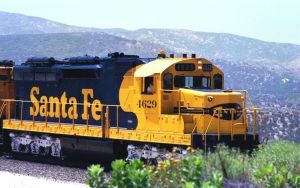 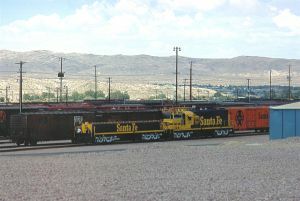 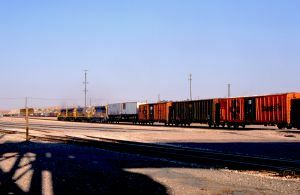 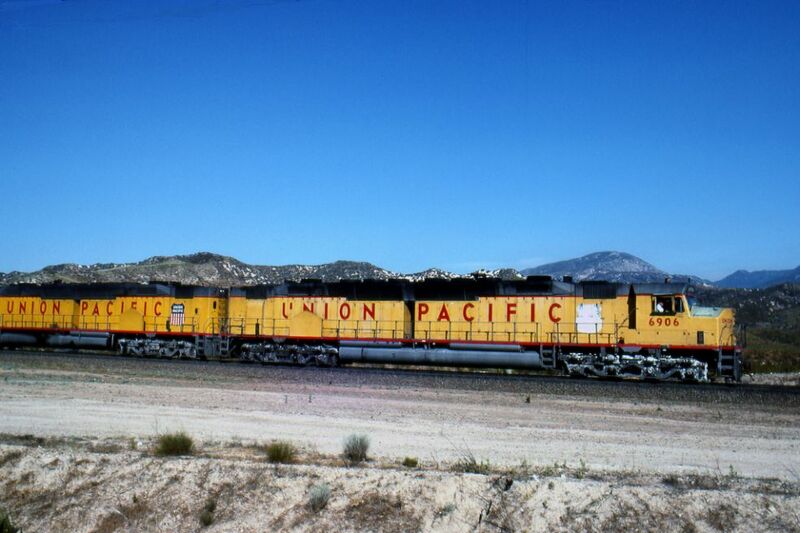 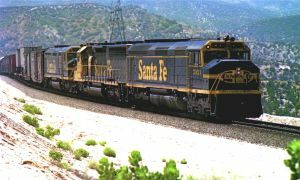 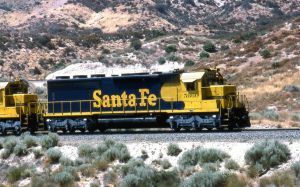 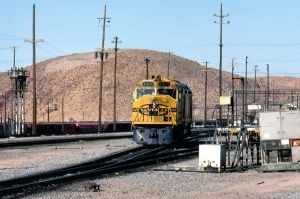 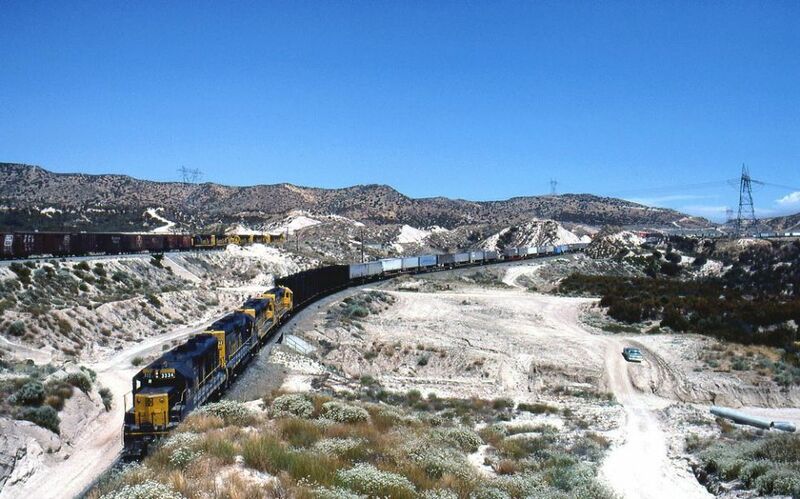 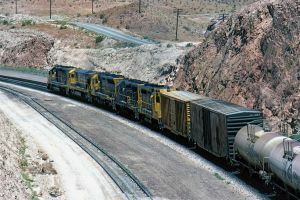 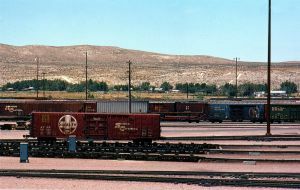 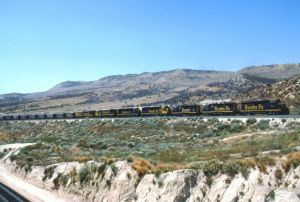 We were very impressed by the colorful trains of Santa Fe, Southern Pacific and Union Pacific, especially in the desert. So, we went again in 1975, 1977 and 1978. 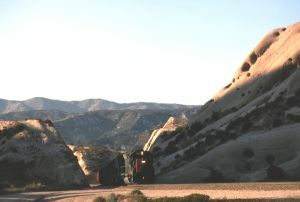 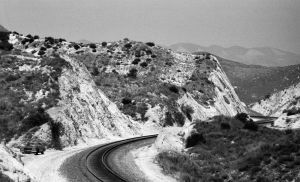 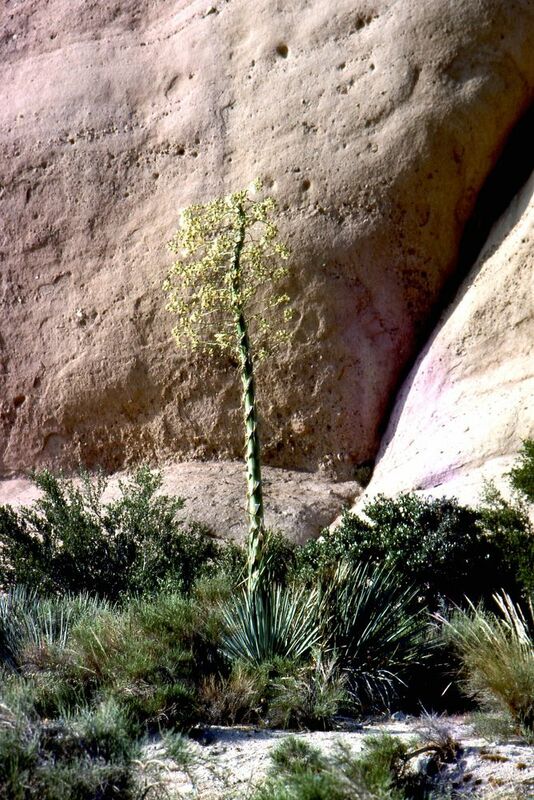 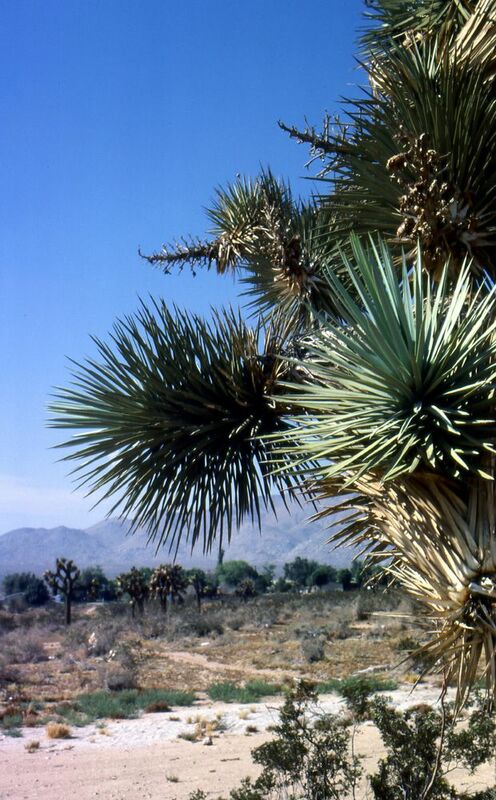 During these 3 trips we did explore Tehachapi Pass and our favorite Cajon Pass. 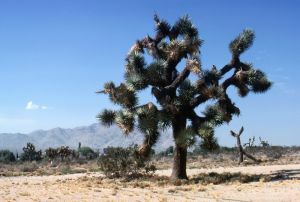 Since our 5th trip, John did not visit the USA again because of marriage and his child (Michael). Nevertheless, thru modern technology, John is sharing his "old" slides and negatives with us. 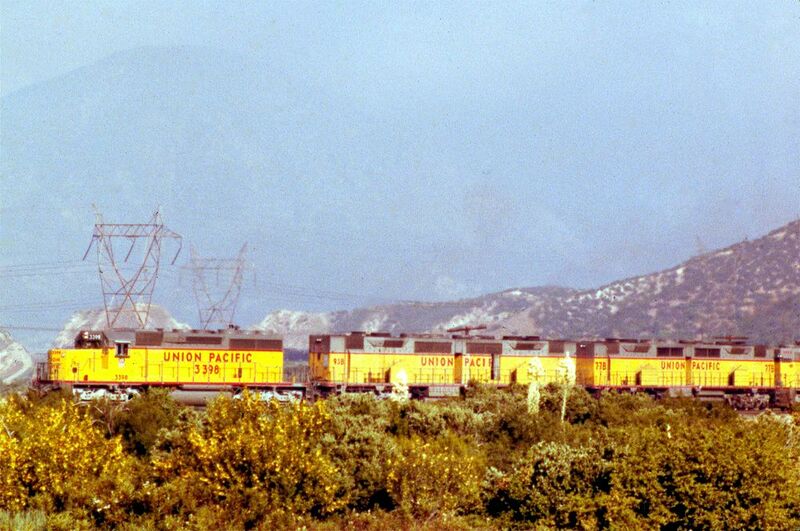 Of course, the quality is sometimes not the best because of color fading. 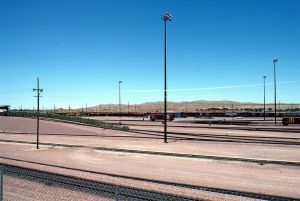 This is the place where we can see all 3 tracks. 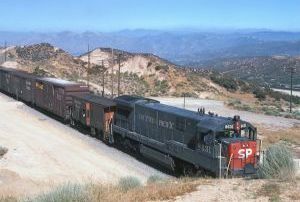 On top is the SP Colton-Palmdale Cutoff track, below is the SF North track (2,2% grade) and further down the SF South track (3% grade). 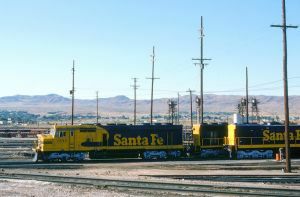 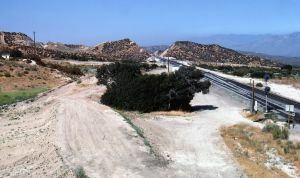 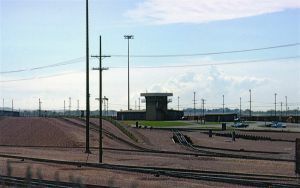 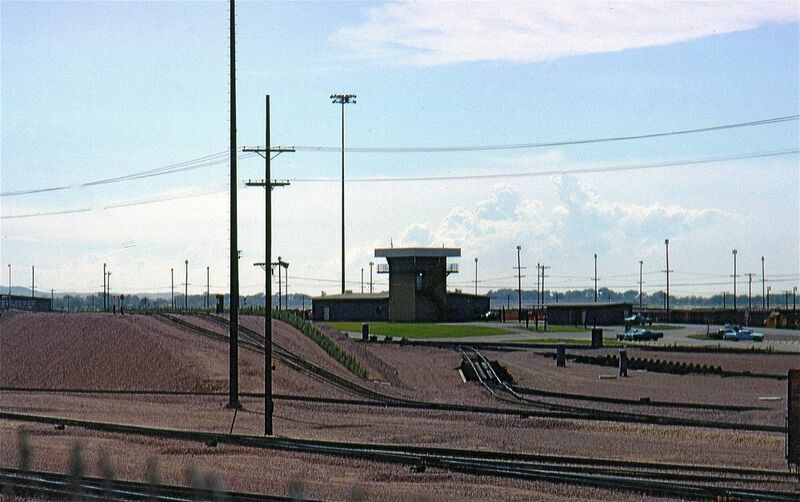 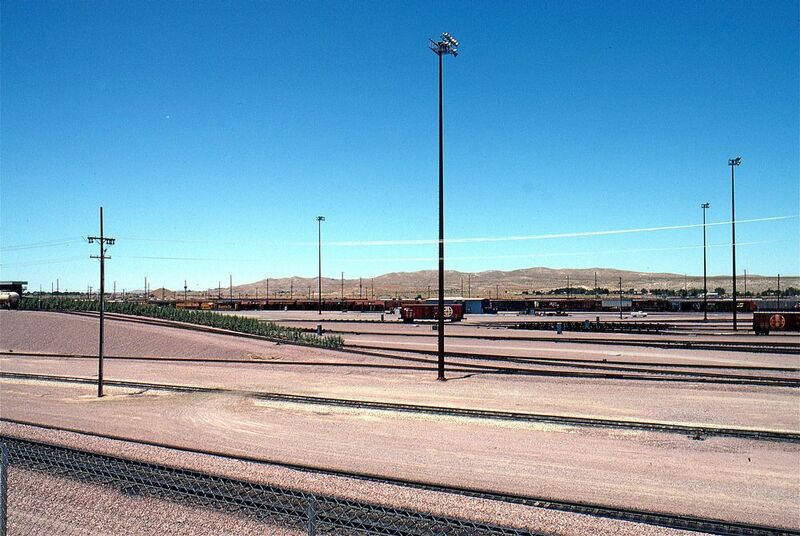 The place where the Santa Fe South track (ST) and North track (NT) are separating is West Summit Island (WSI). 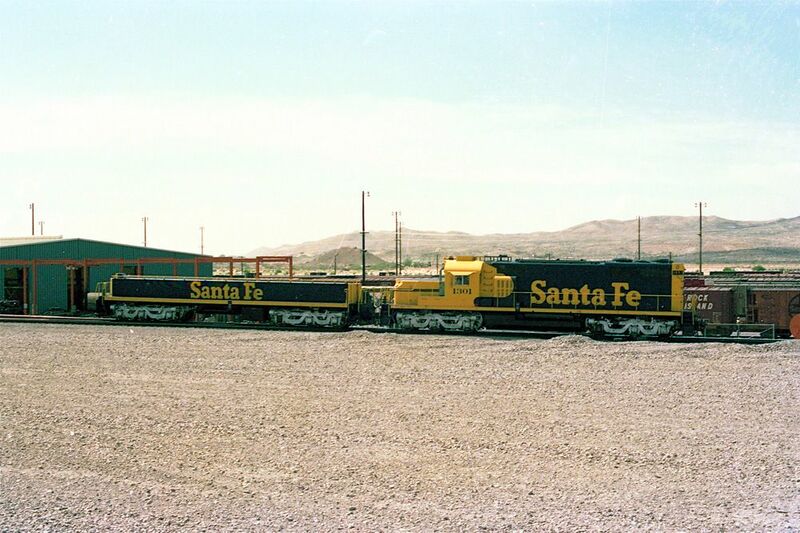 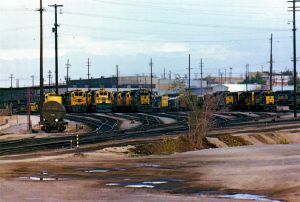 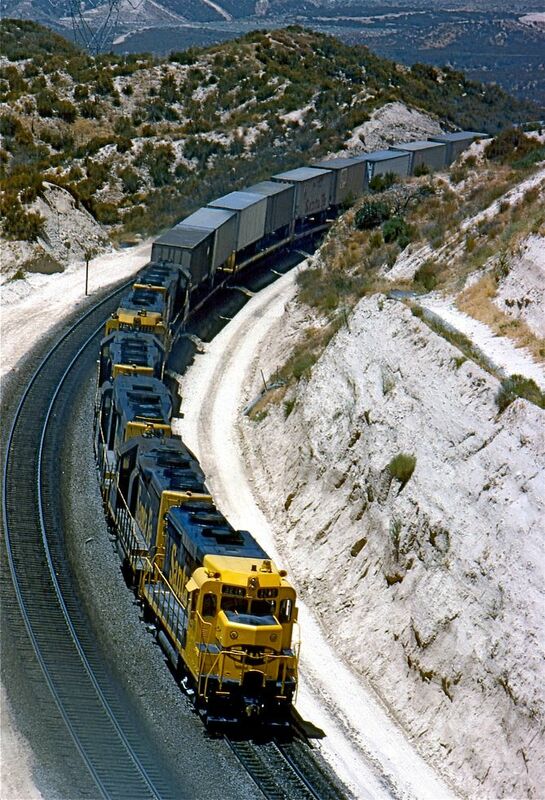 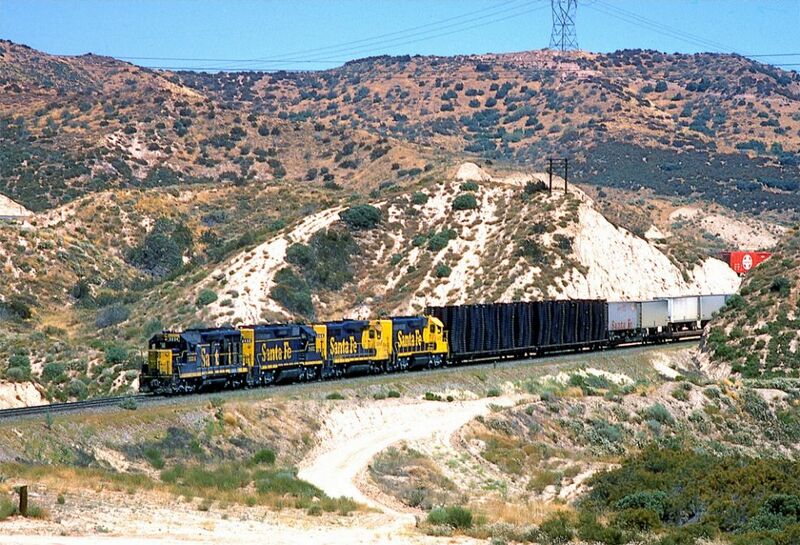 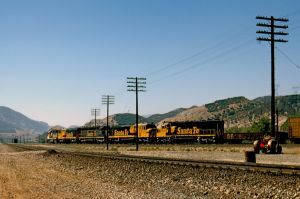 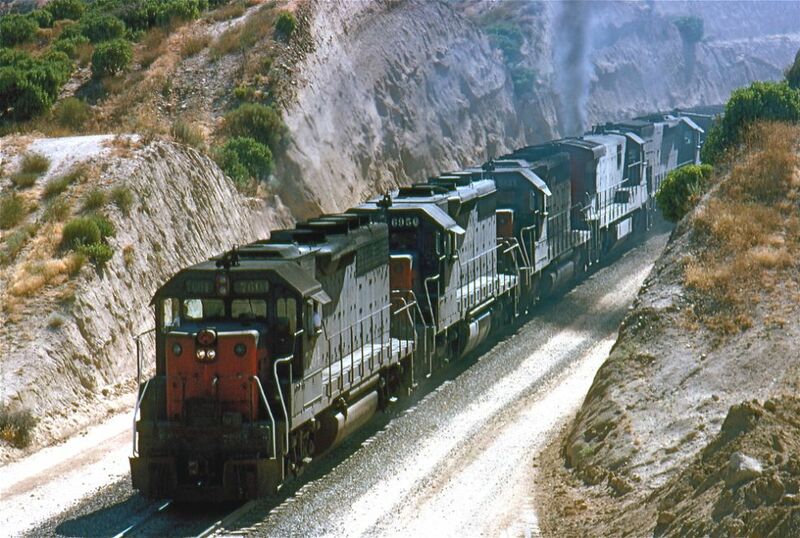 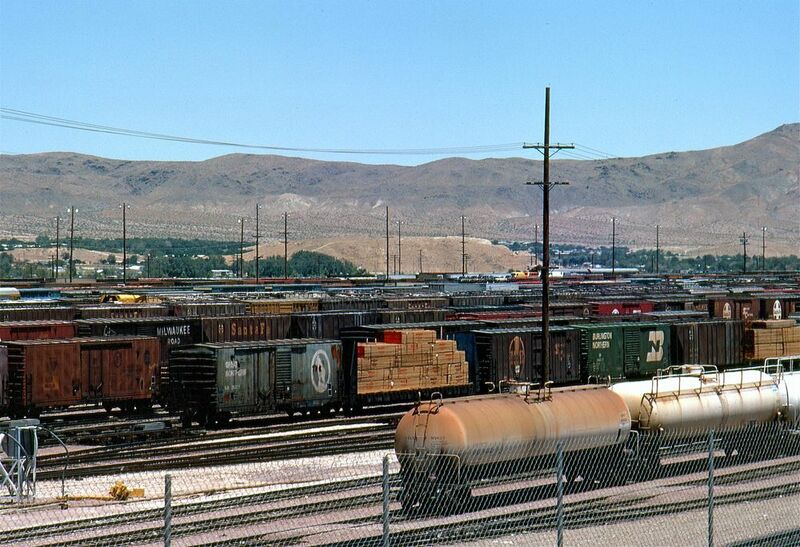 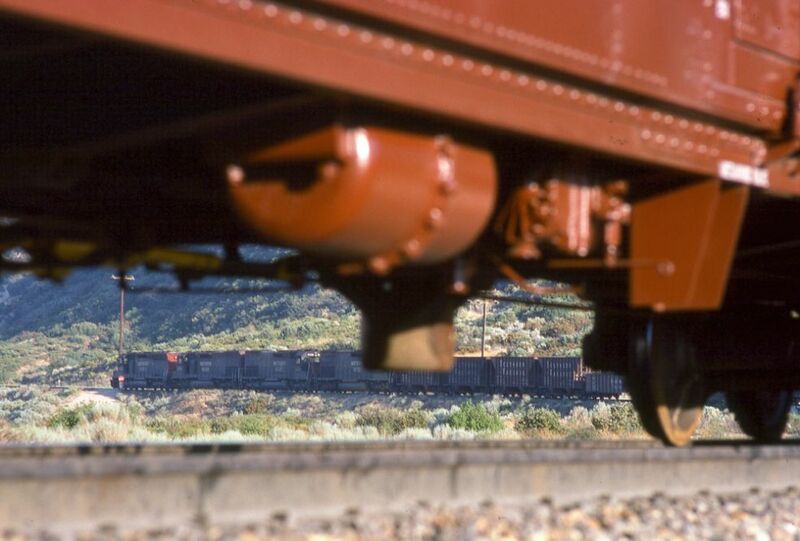 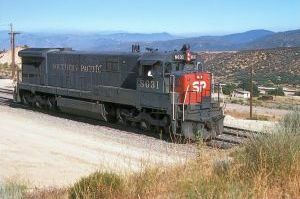 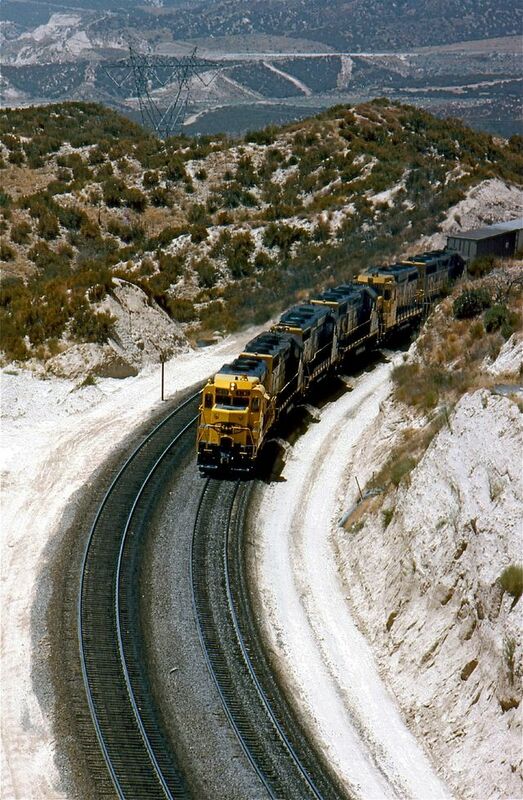 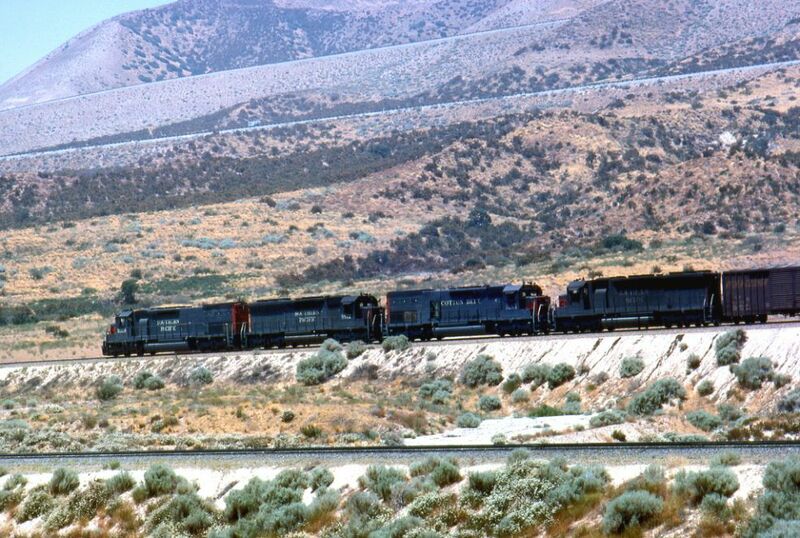 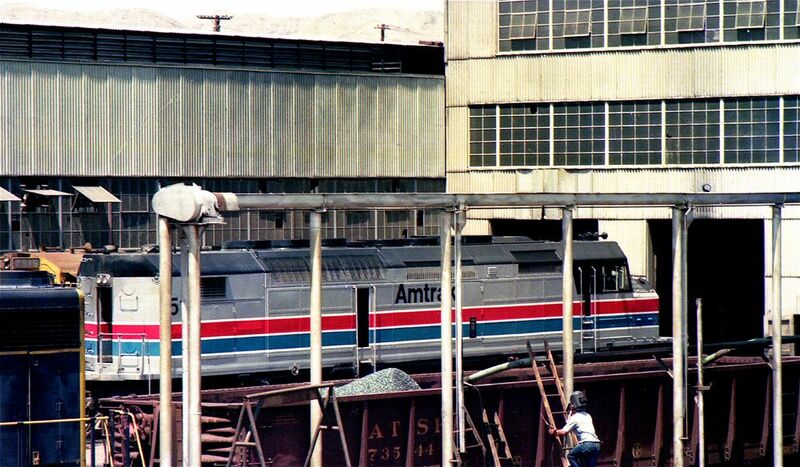 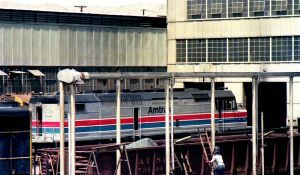 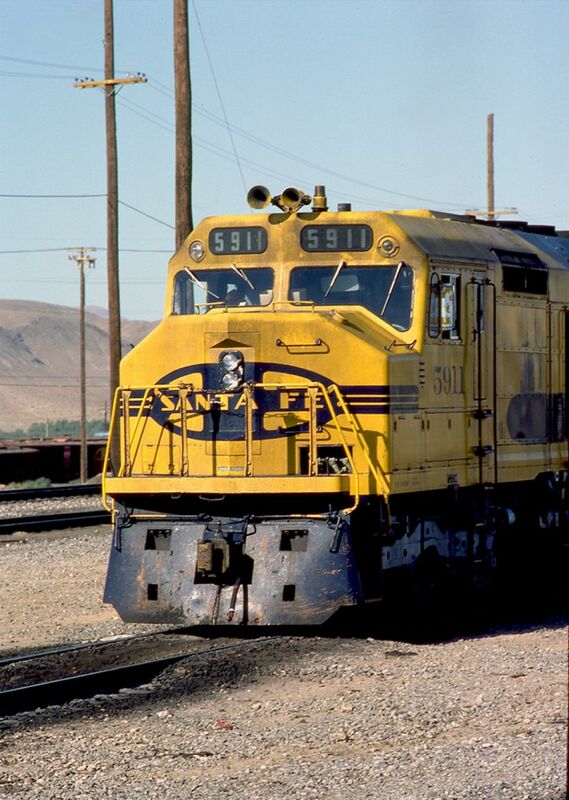 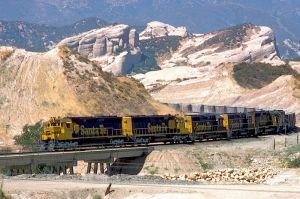 Photos J080 - J082: A solid consist of 5 UP SD40-2 locos, called "Fast Forties". 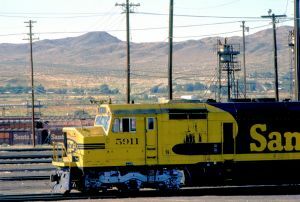 Nos. 8007 and 8026 are SD40-2H rebuilt to 80 mph speed limit. 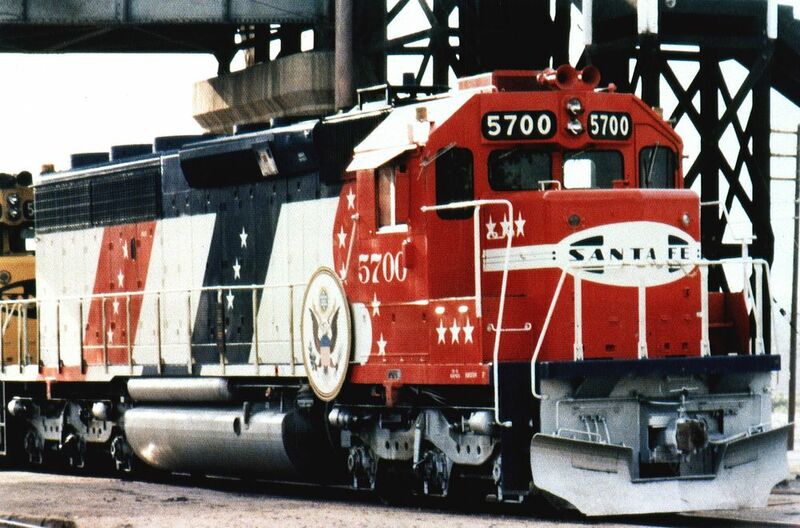 Nos. 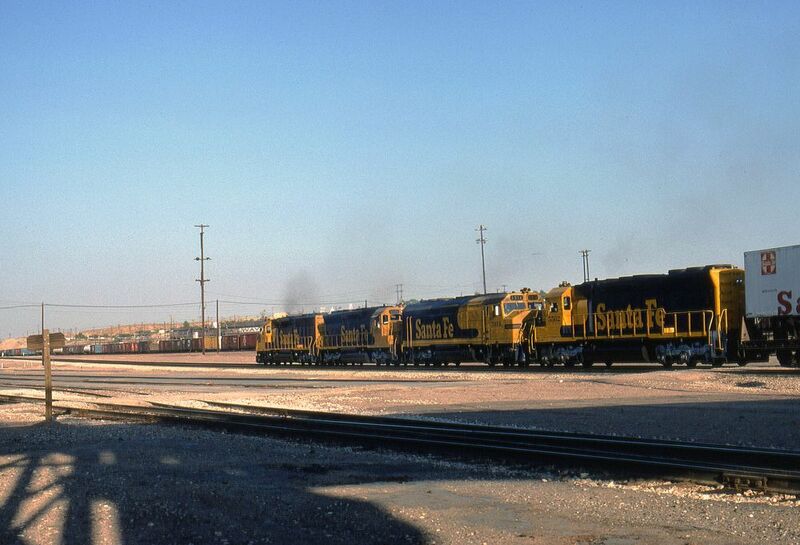 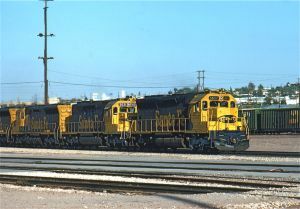 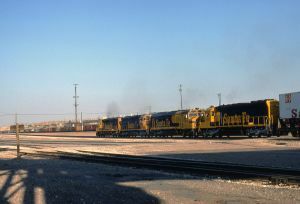 8040, 8043 and 8049 are SD40-2M and built in 1976 with the same gearing for 80 mph. These locos were also used together with DDA40X locos. The caboose is the office of the Train Order Operator who receives his instructions from the dispatcher located in downtown Los Angeles at the Pacific Electric building. 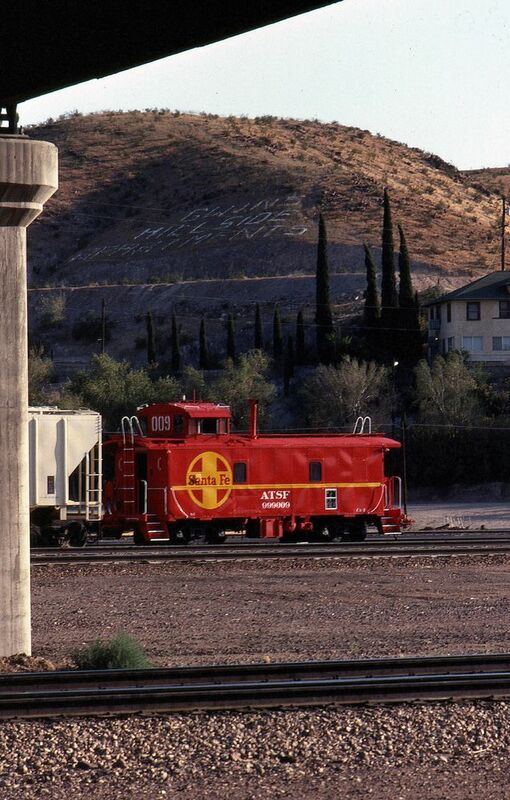 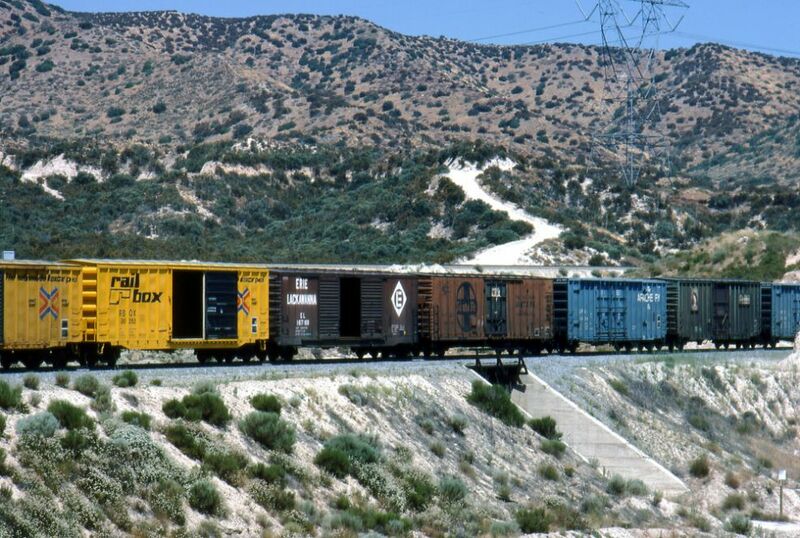 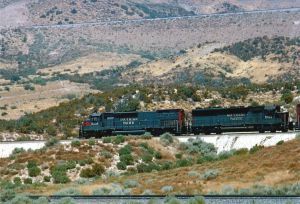 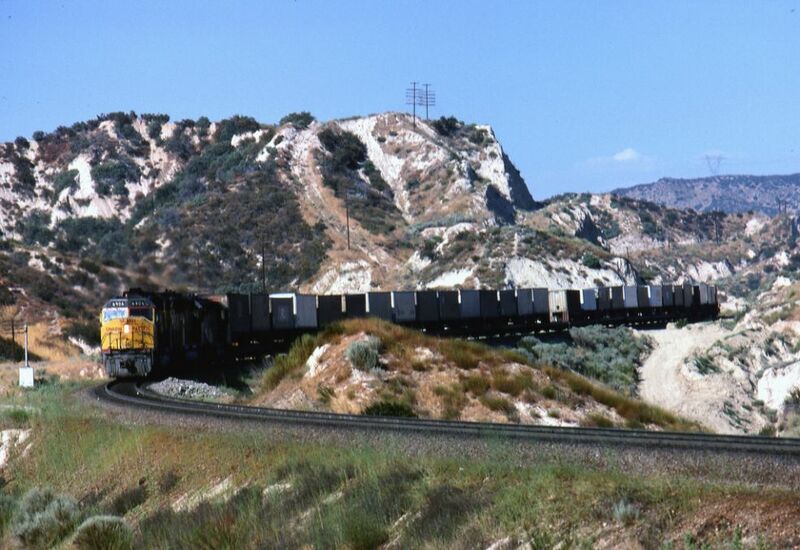 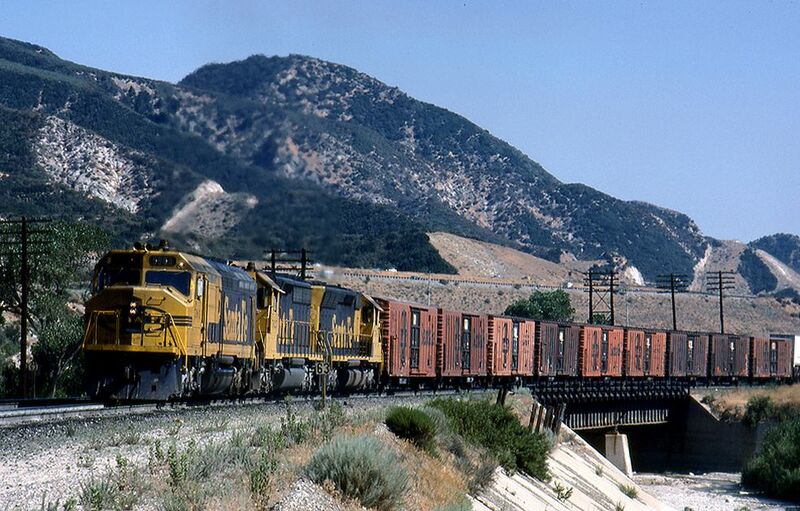 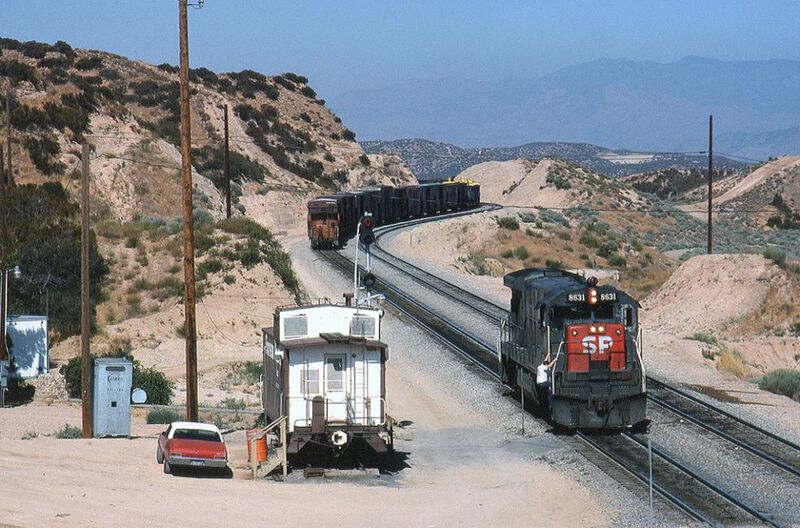 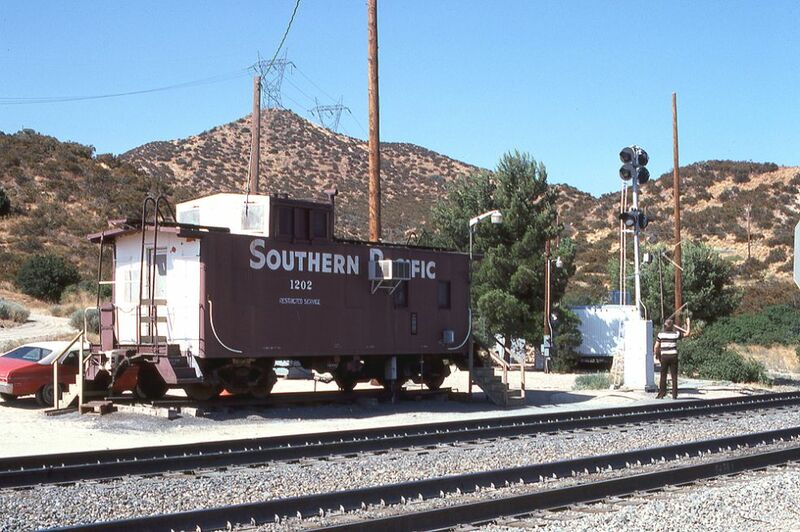 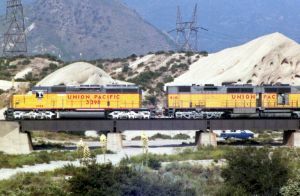 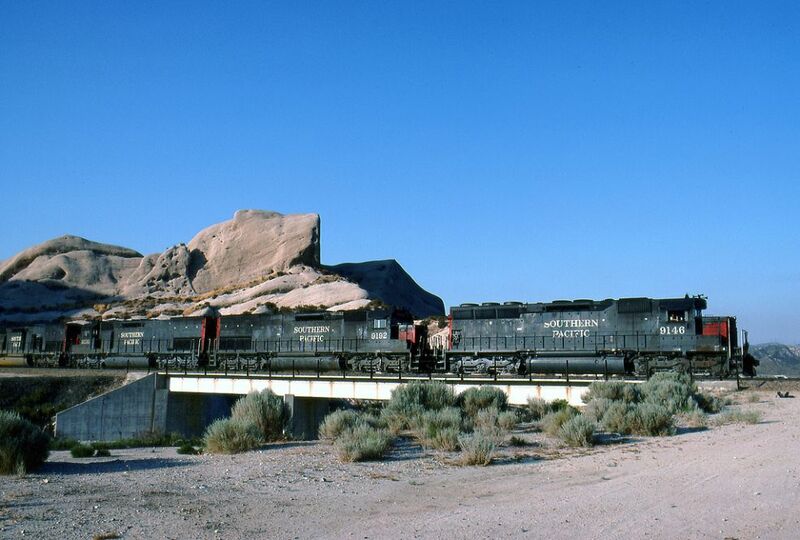 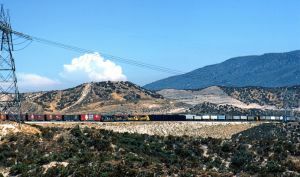 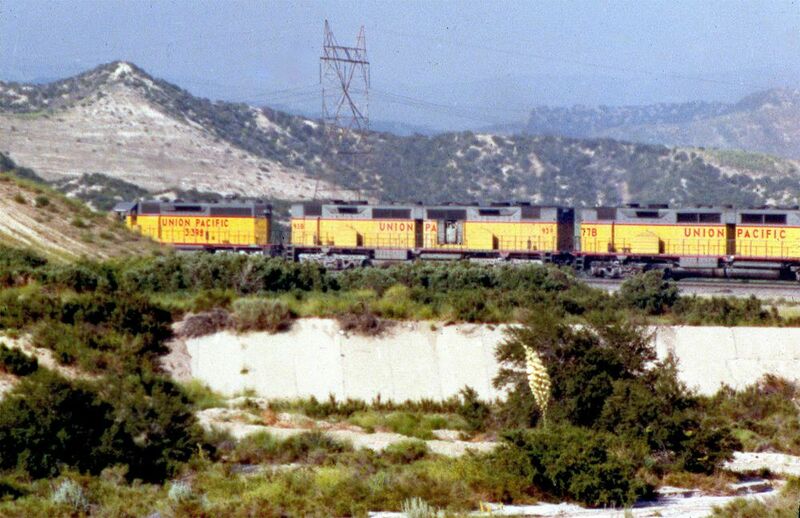 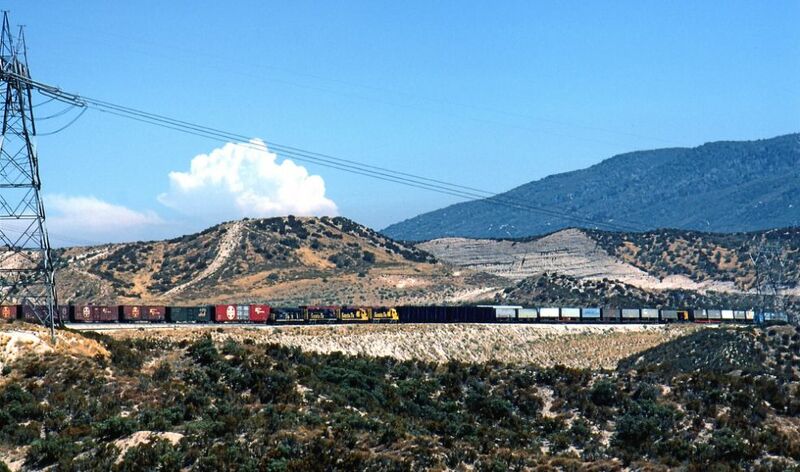 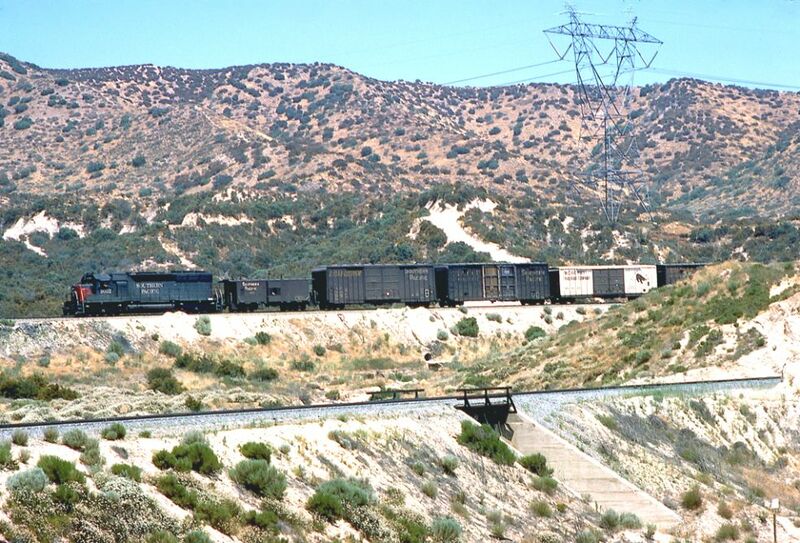 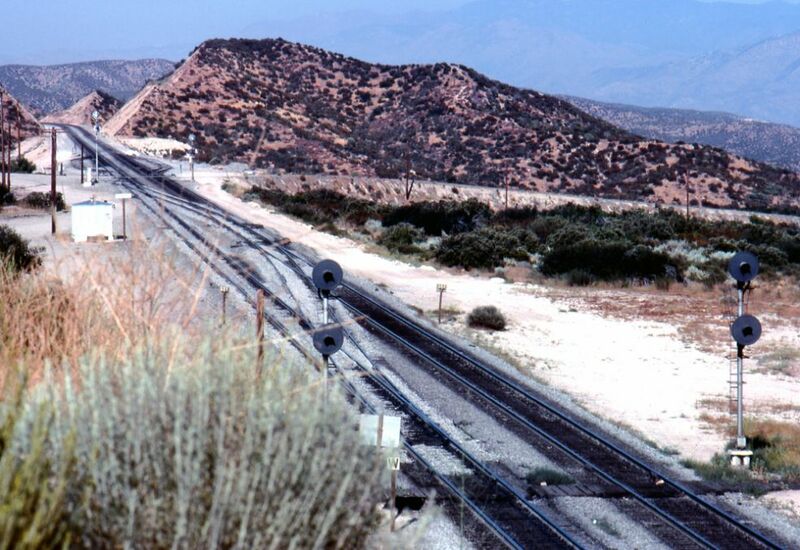 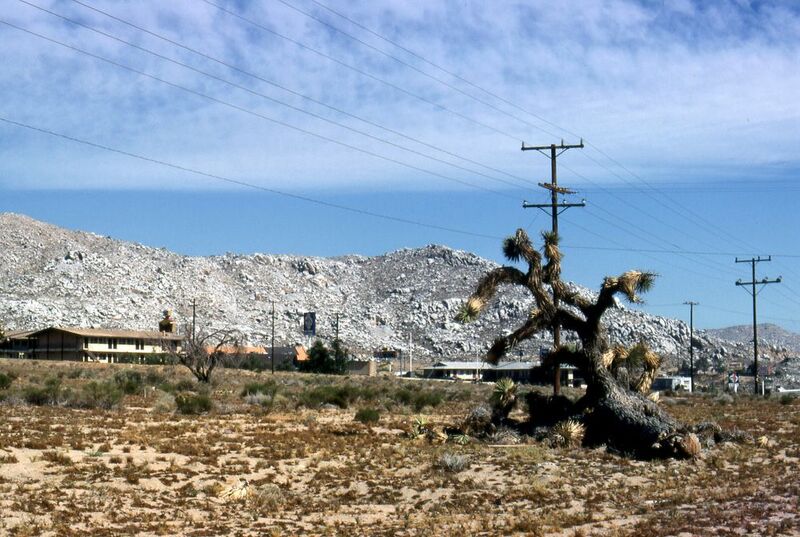 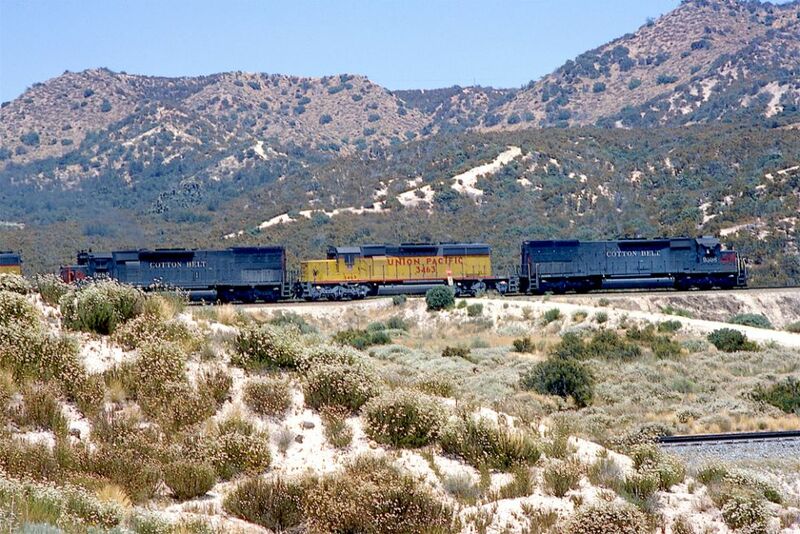 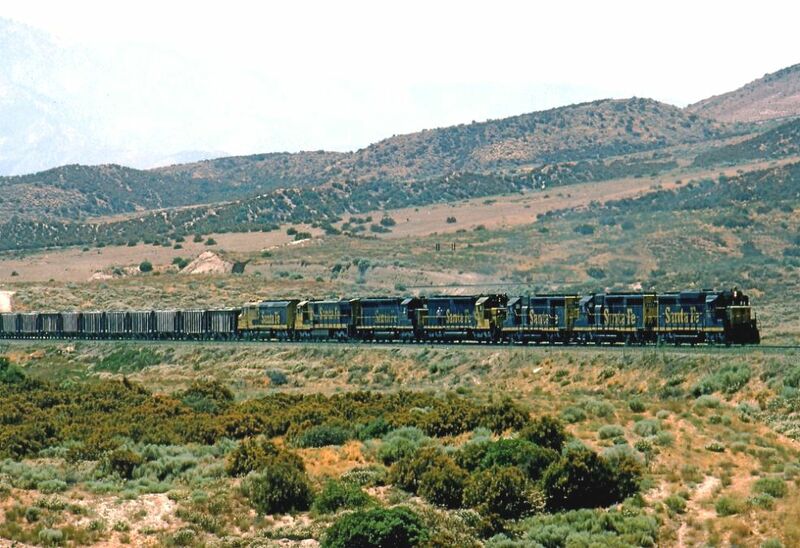 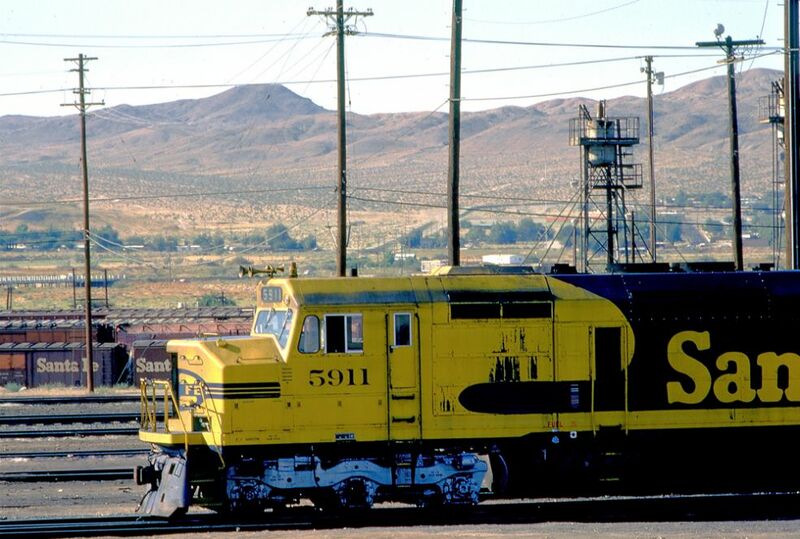 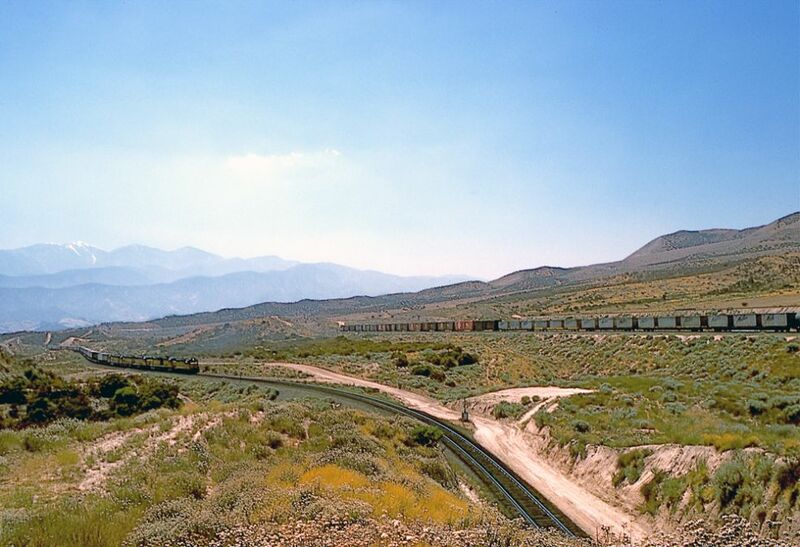 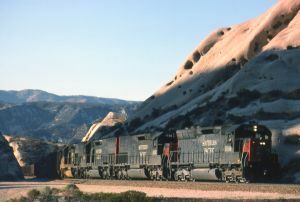 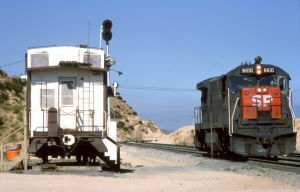 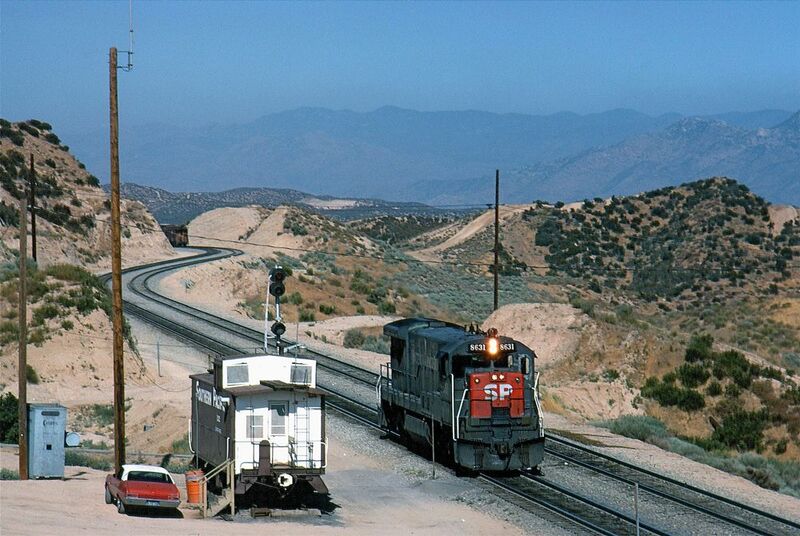 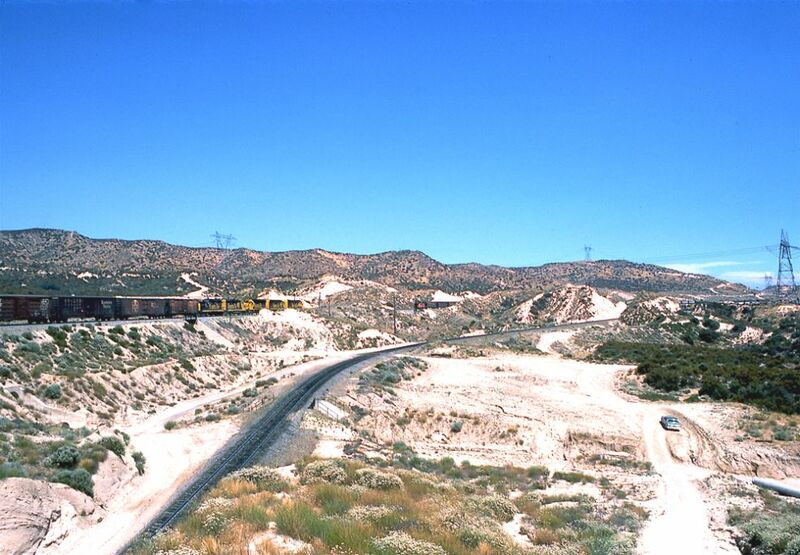 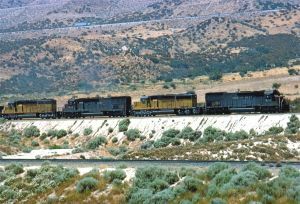 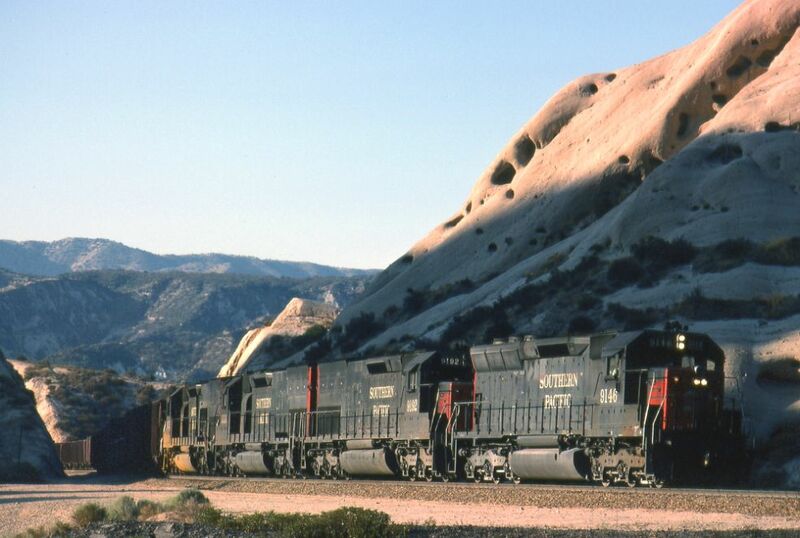 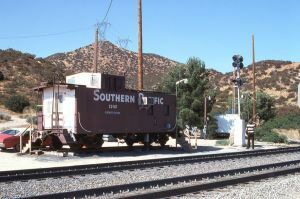 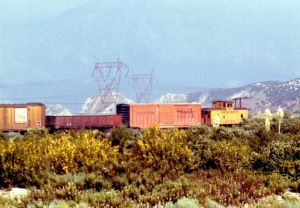 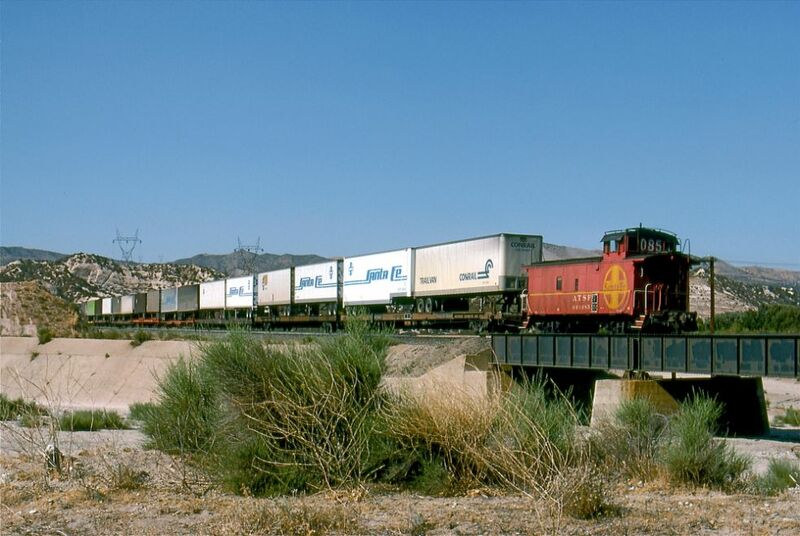 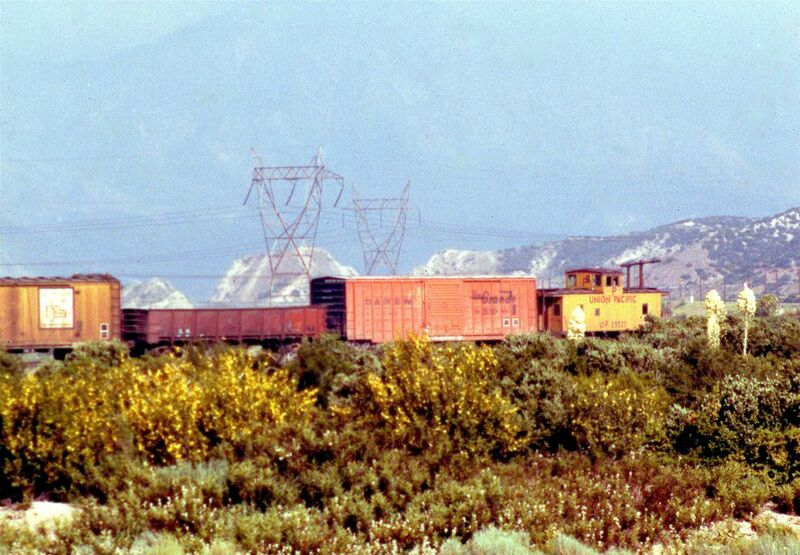 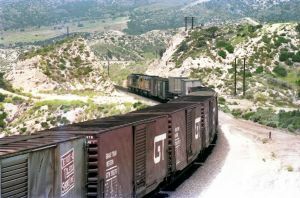 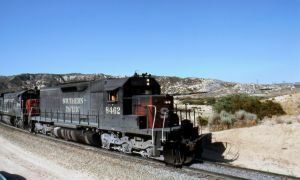 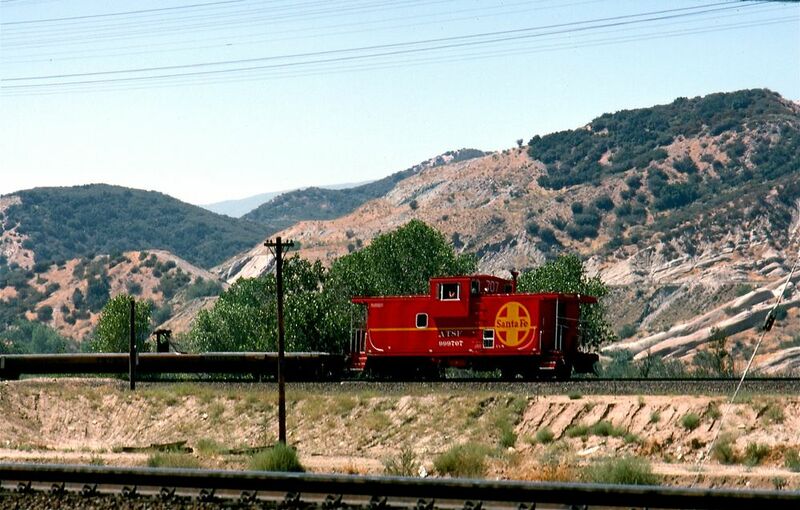 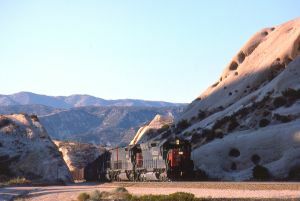 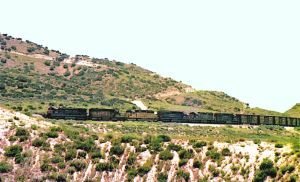 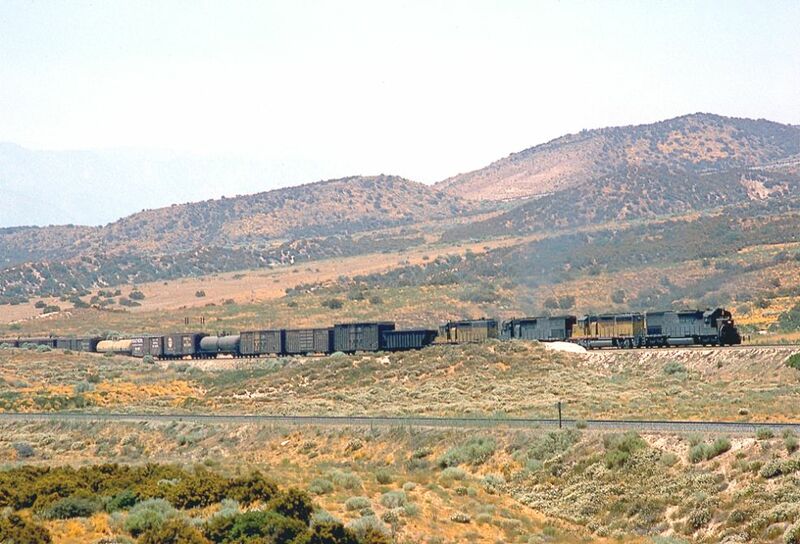 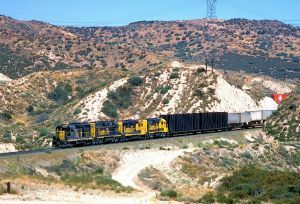 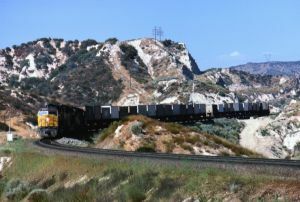 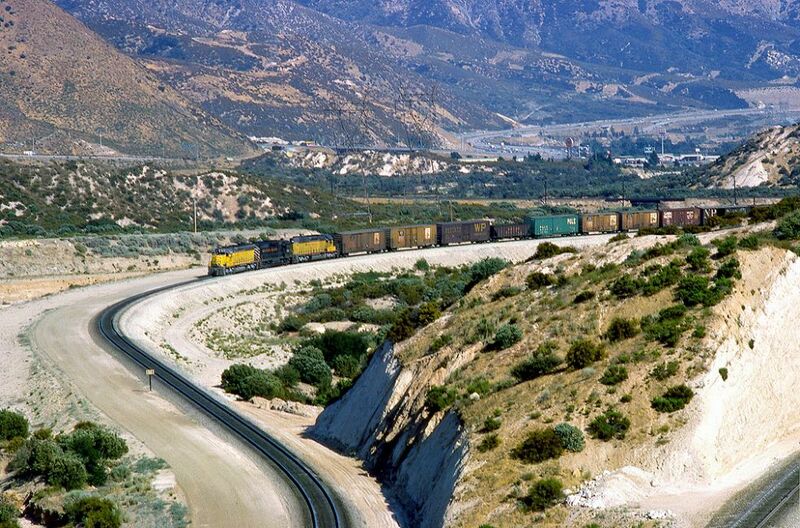 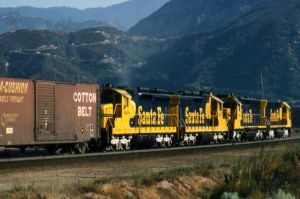 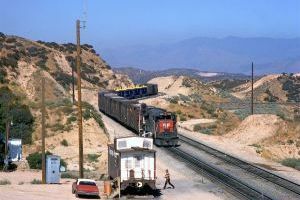 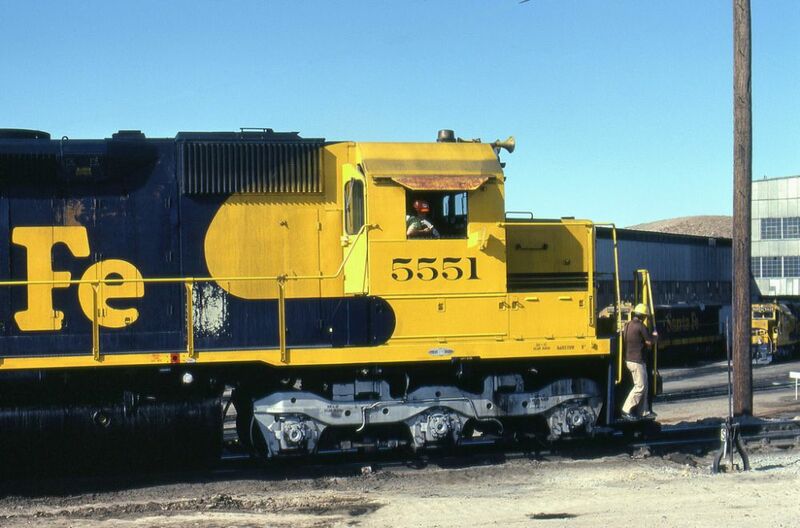 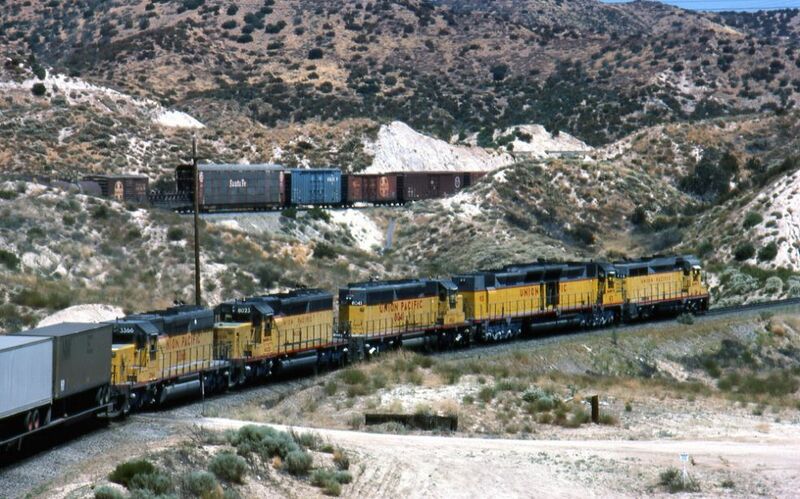 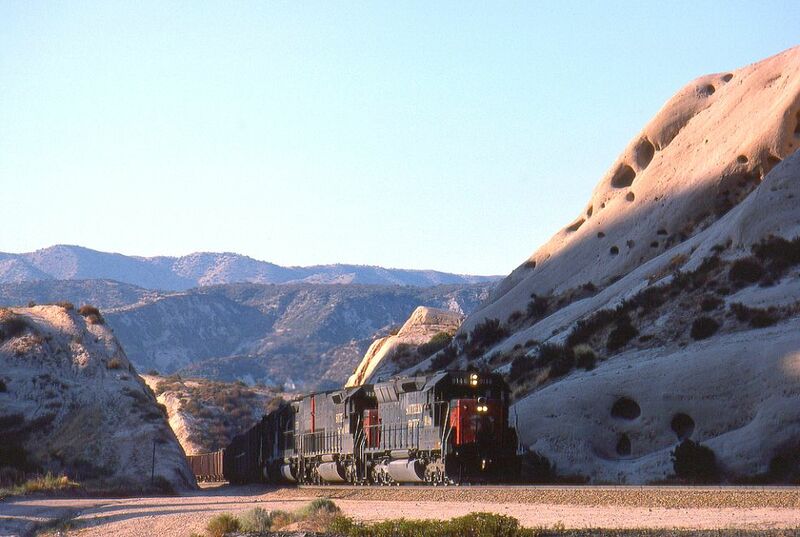 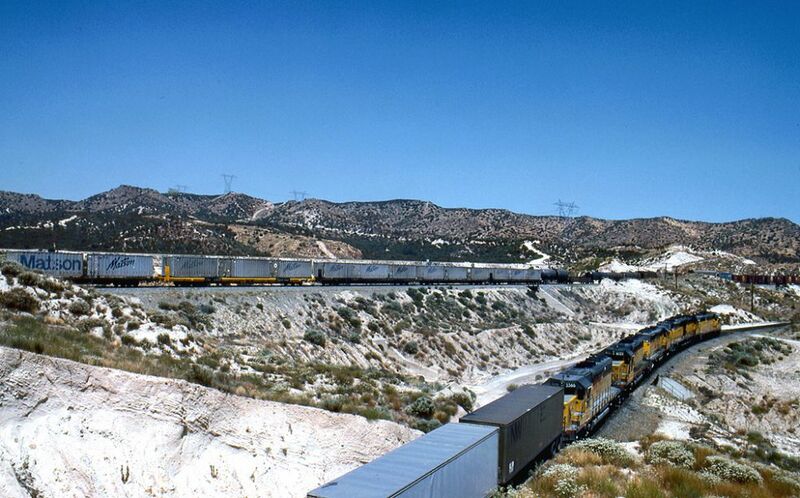 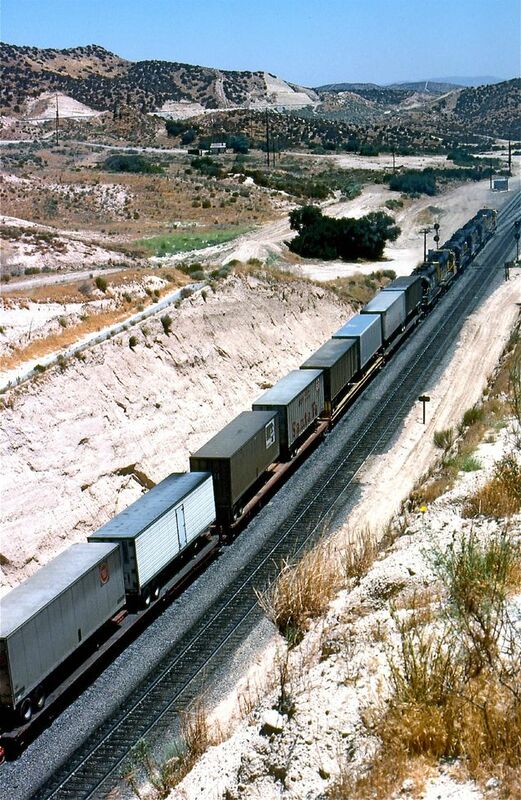 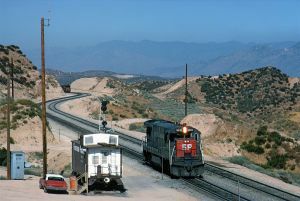 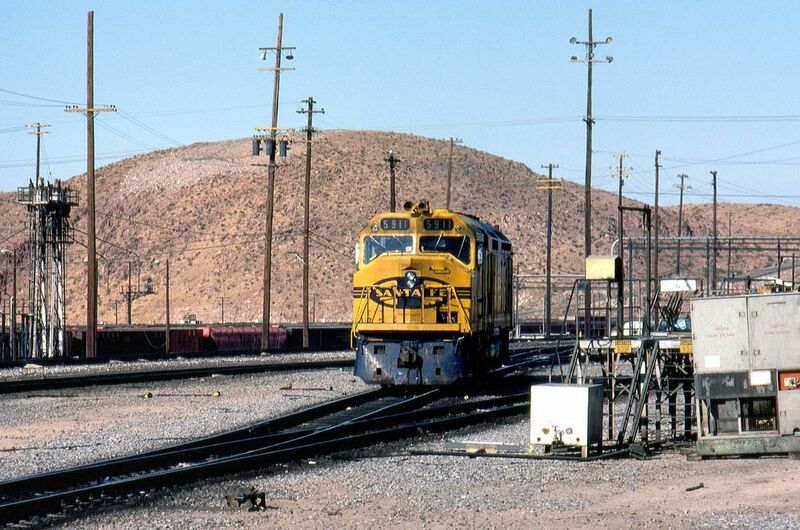 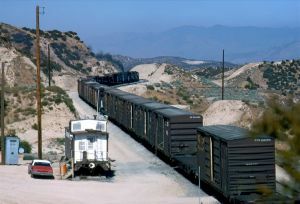 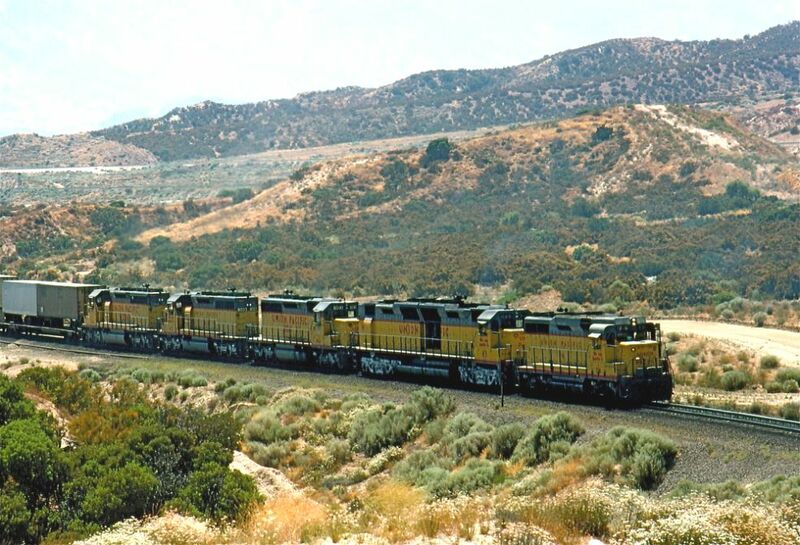 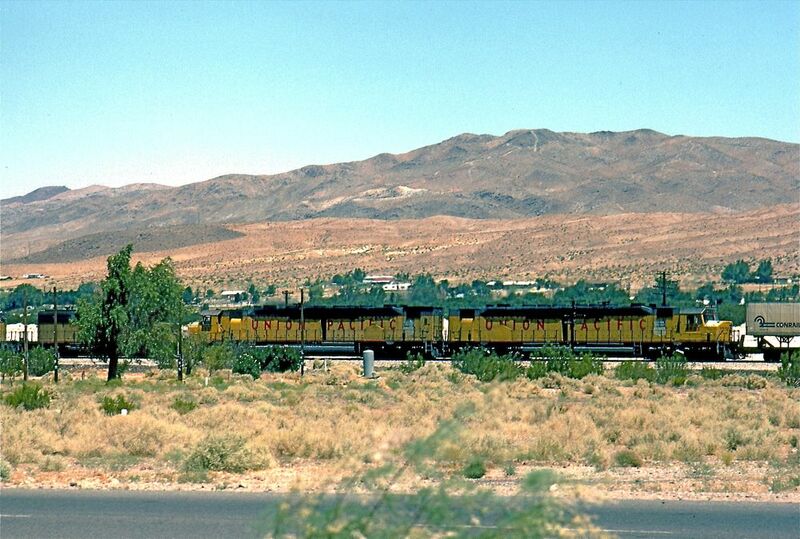 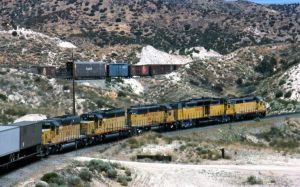 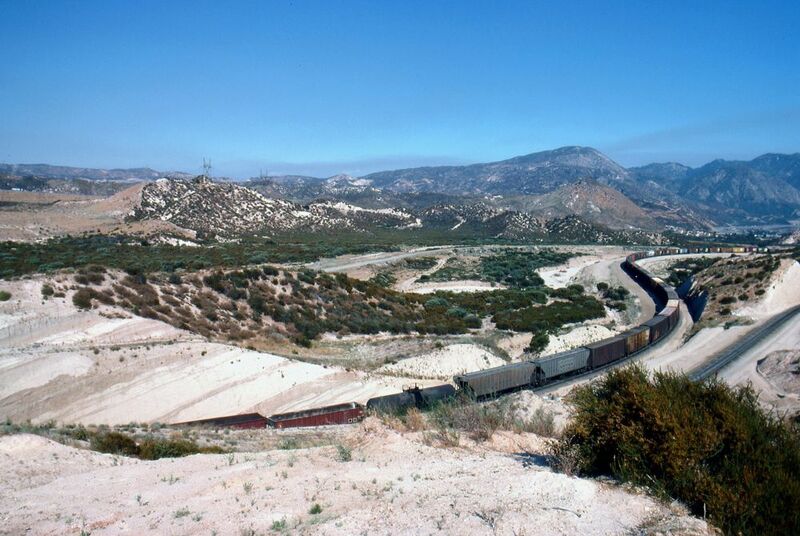 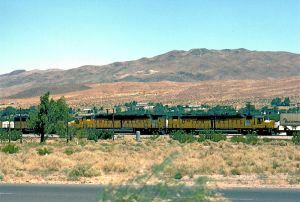 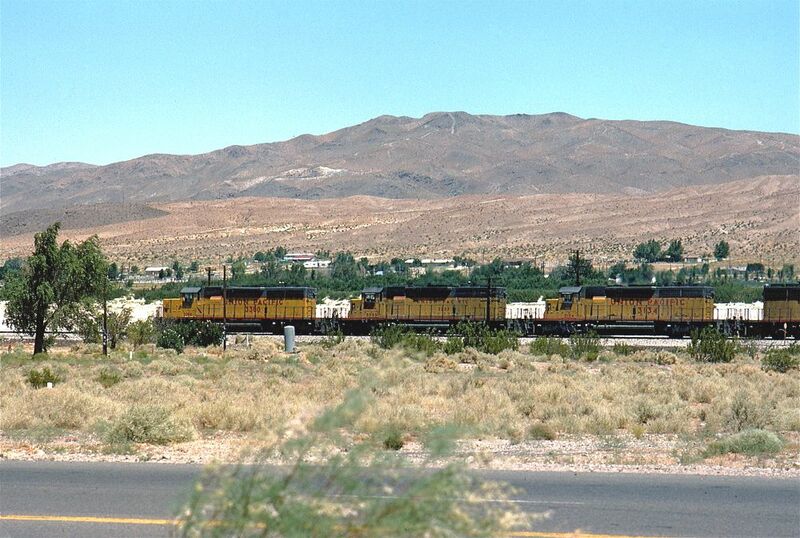 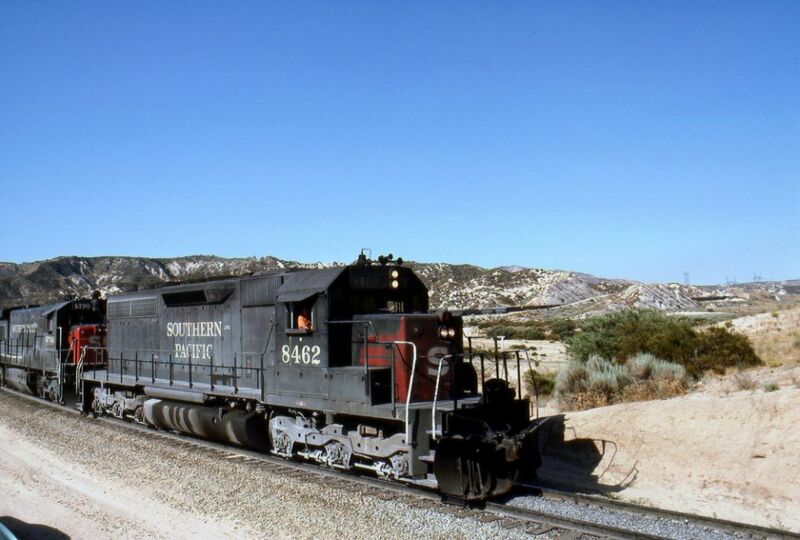 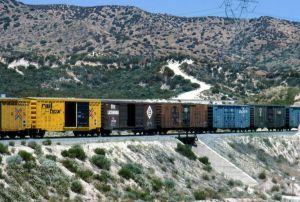 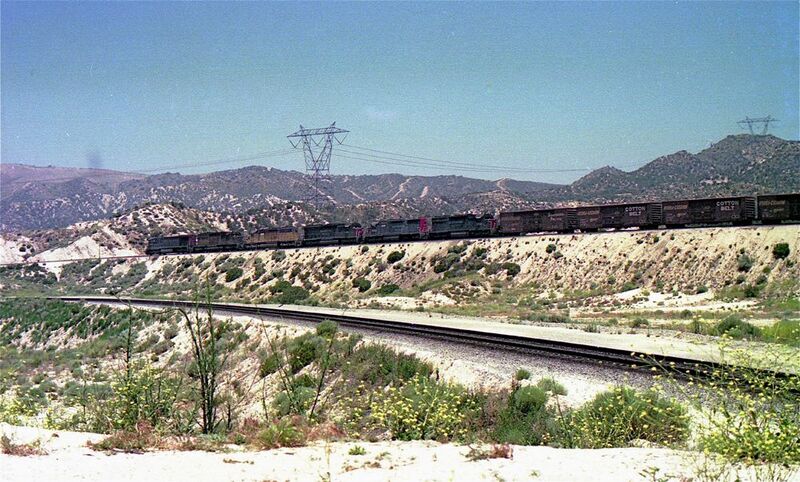 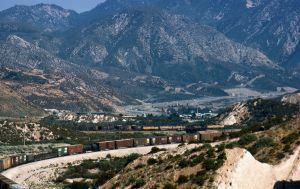 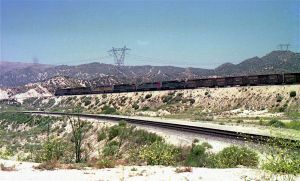 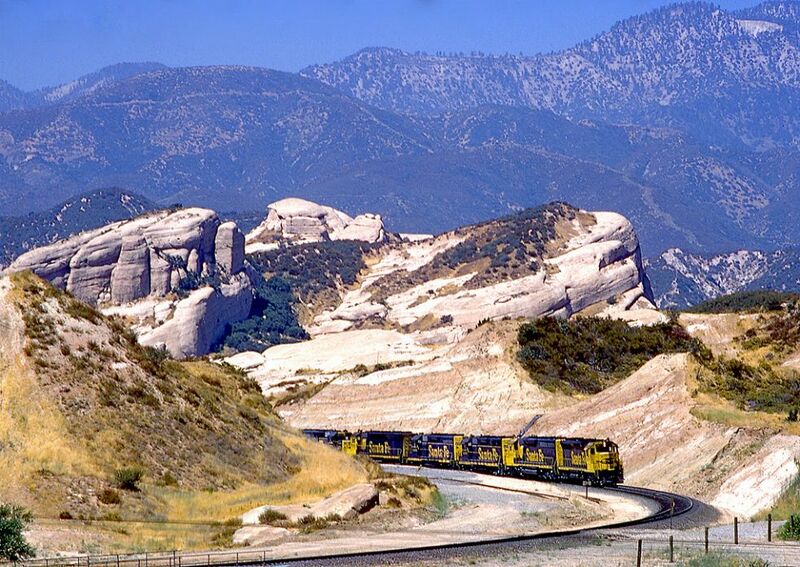 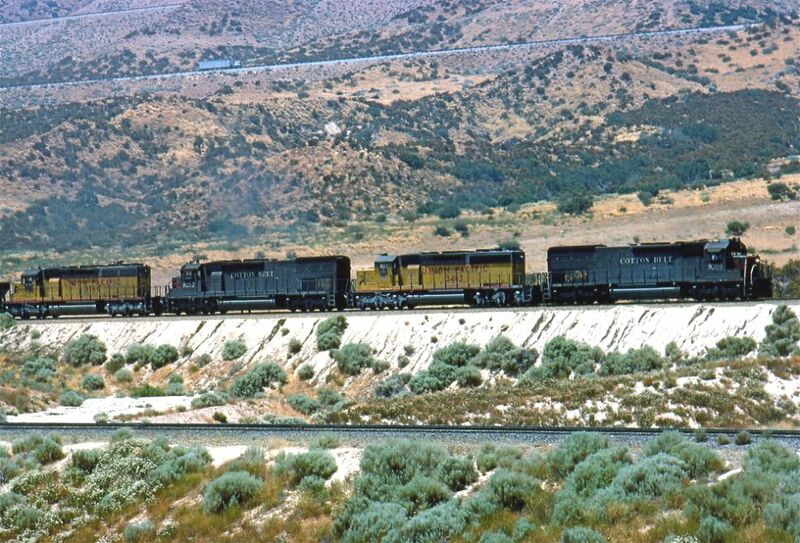 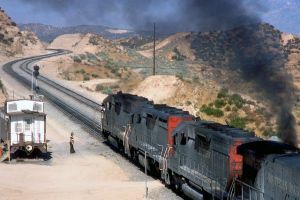 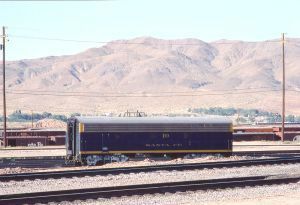 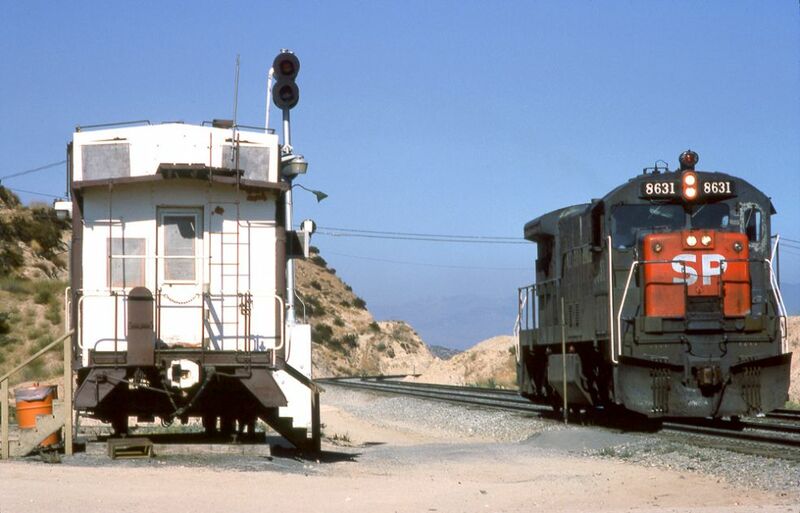 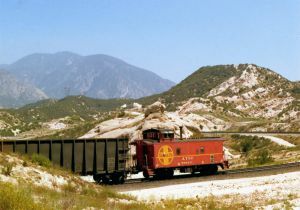 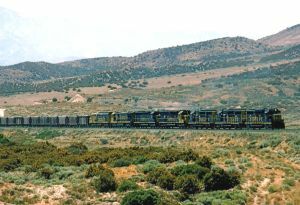 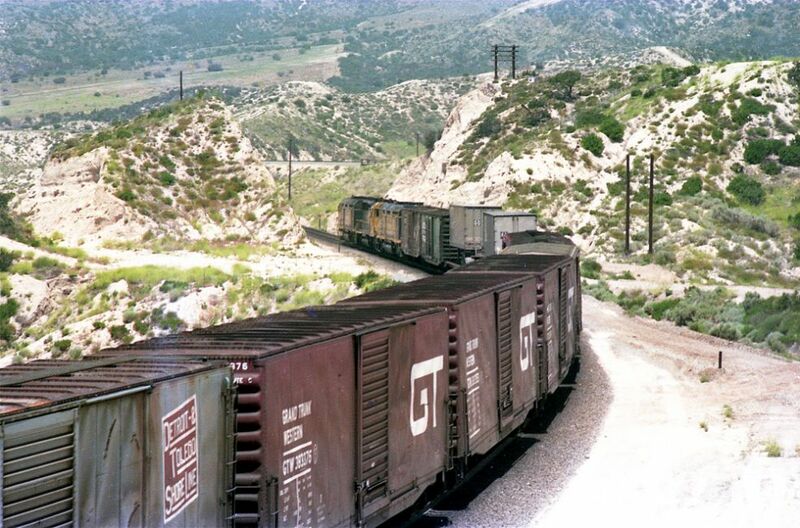 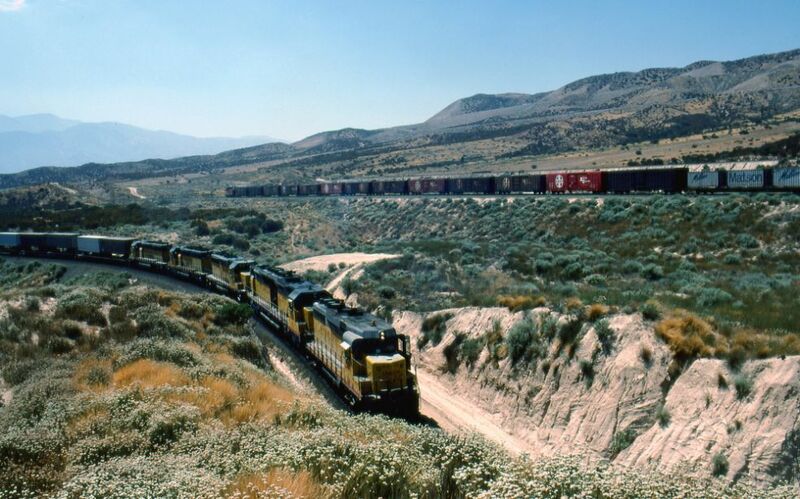 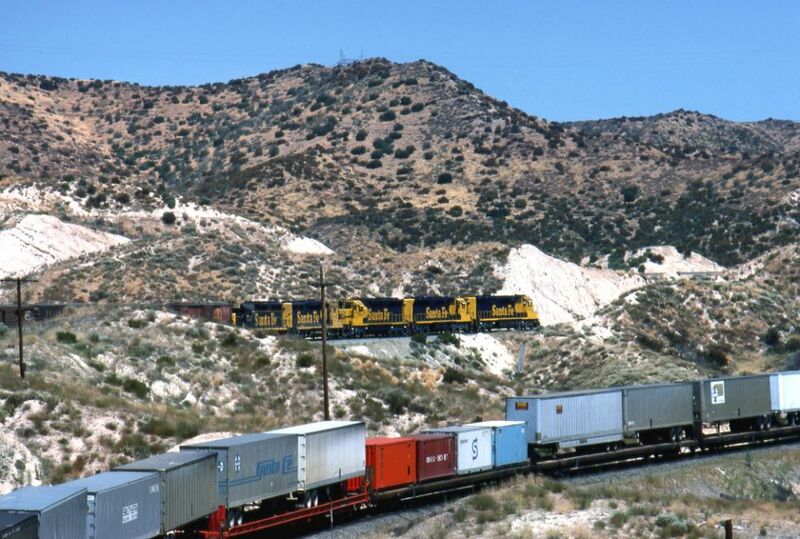 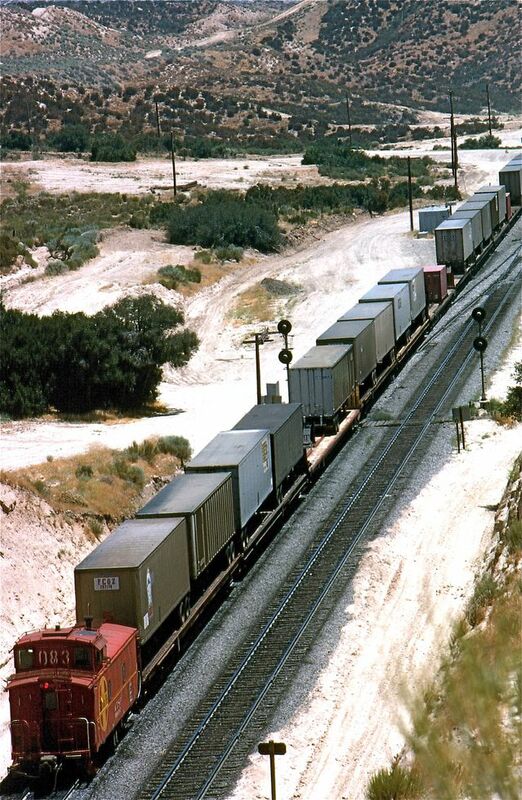 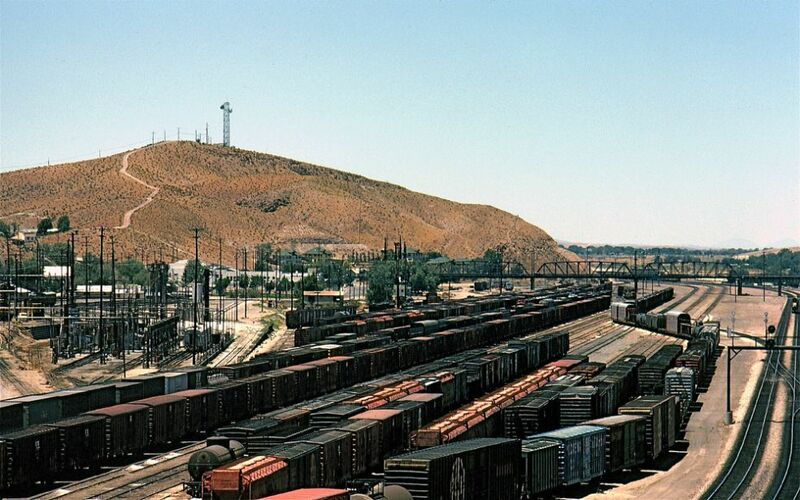 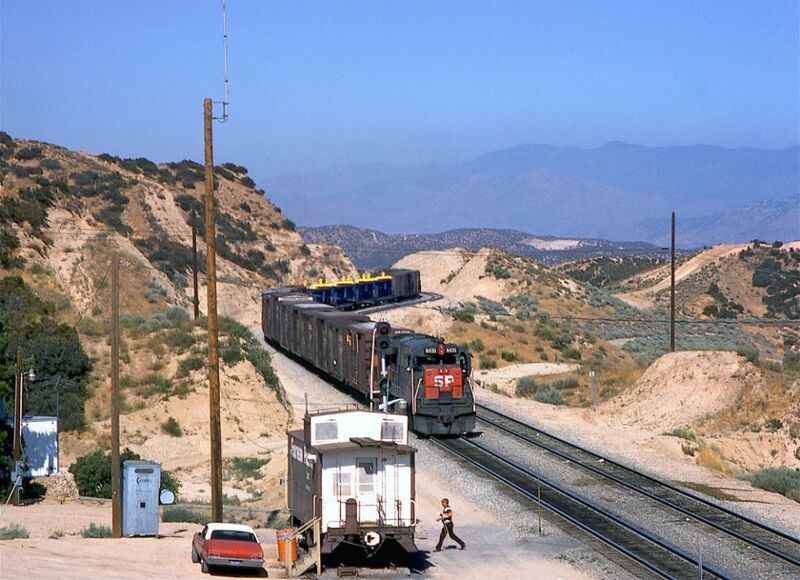 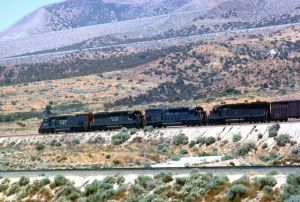 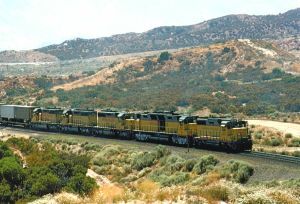 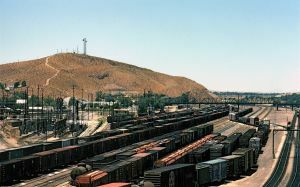 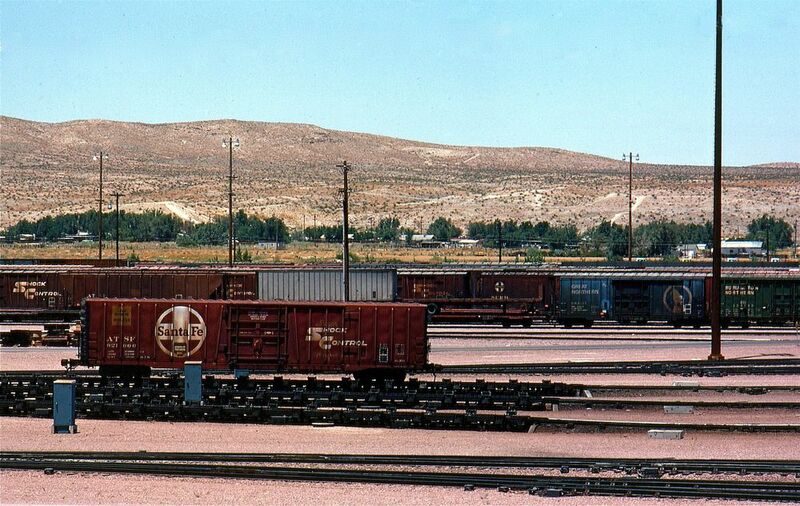 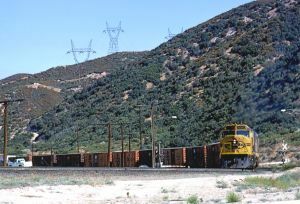 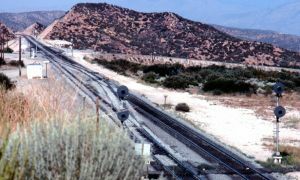 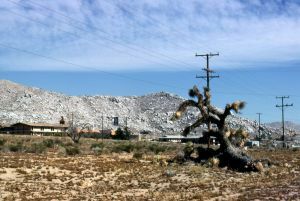 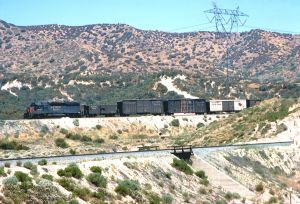 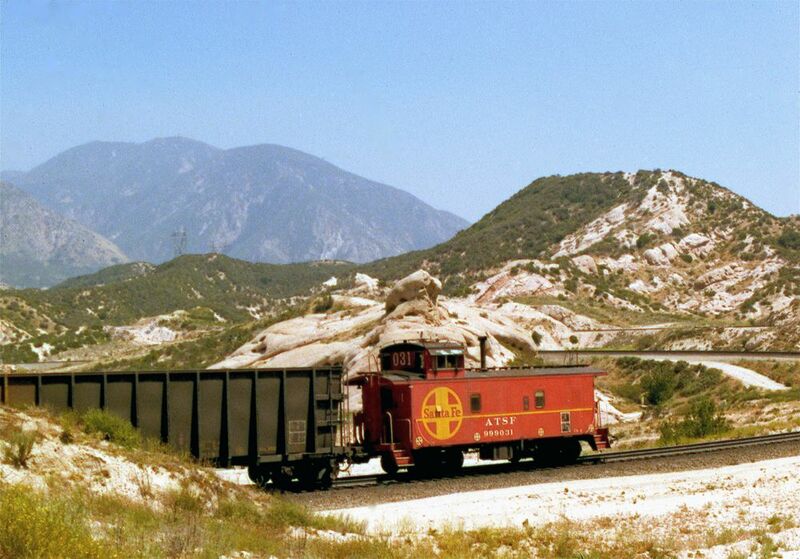 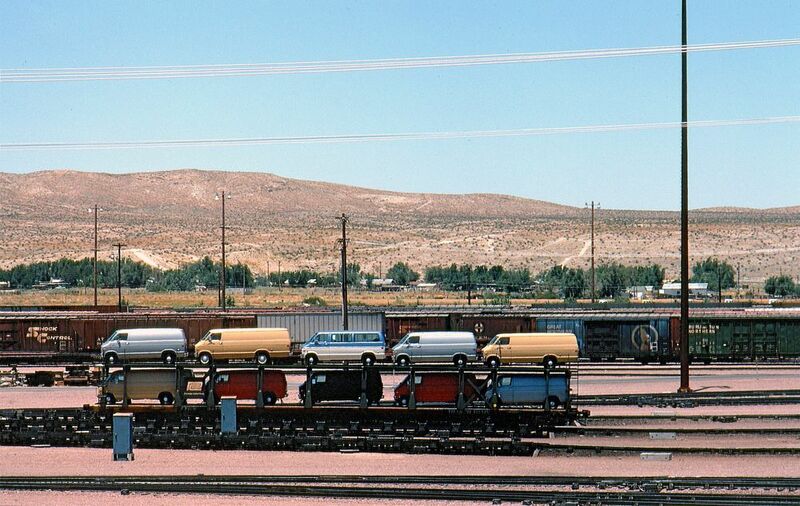 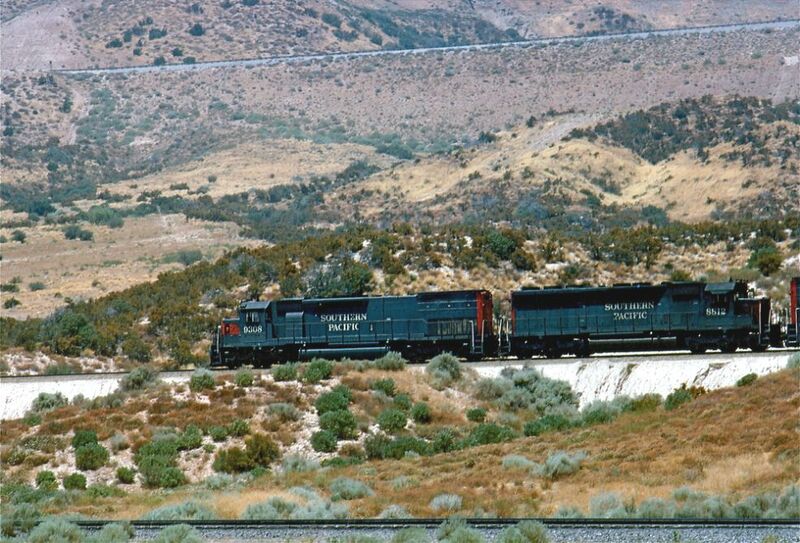 For the first few years the Colton Cutoff was operated by train orders and retired cabooses (with their ends painted white so approaching trains would not mistake them for an active caboose) were placed at several sidings between Palmdale and West Colton.